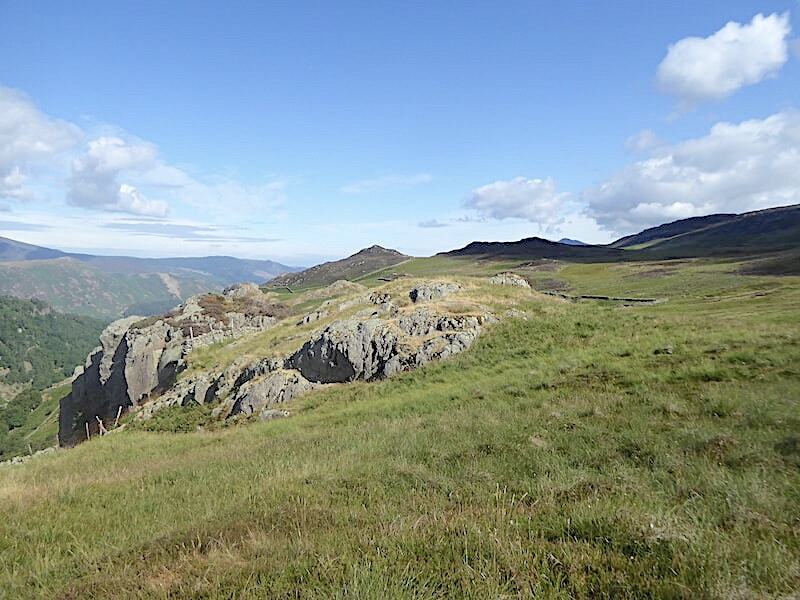 Today was our only free day this week and there’s a certain football match on tonight so, as we’ve had no rain for several weeks and we needed a short walk which didn’t involve driving long distances we chose to take a walk from Watendlath up to High Seat and then across to High Tove. The usual route from Watendlath goes to High Tove first and then on to High Seat but this can feel like a dreary grassy trudge with few points of interest along the way, so we opted to follow AW’s alternative route via Goat Crags and Reecastle Crag which does at least have a few interesting features to add a little more variety. 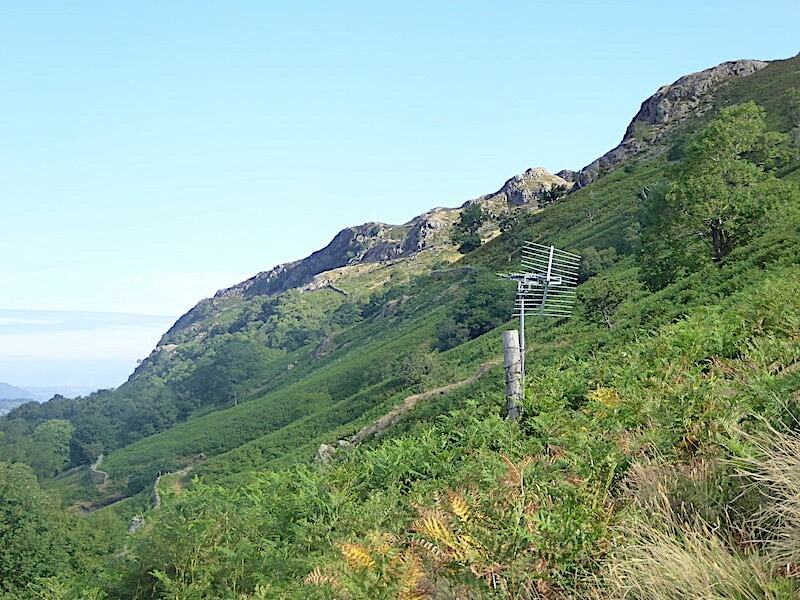 This is only a very short walk and some parts of it can be extremely boggy but after such a prolonged dry period we felt confident that it would have dried out sufficiently to enjoy a trouble free walk across a section of the Central ridge. It was a really enjoyable walk in more lovely weather and the all round views were excellent, so much so that I took a huge amount of photos, although I haven’t included them all here. A kid in a sweetshop couldn’t have had a more mouth watering selection. The start of the walk is quite inconspicuous and there’s no signpost but walk a short way back down the road and beyond the last house on the right is this green lane, the grit bin is a useful marker. 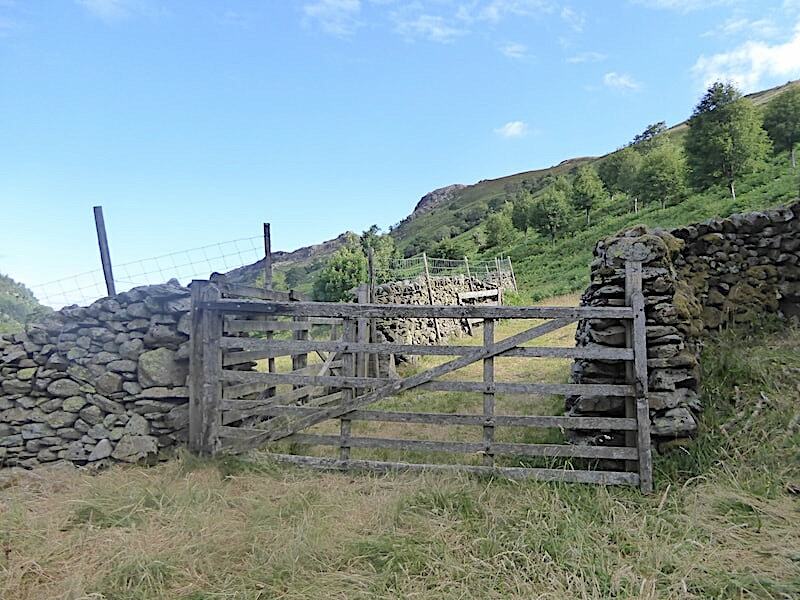 It looks as though it might lead into someone’s back garden but stick with it …..
….. as it leads up to these two gates. 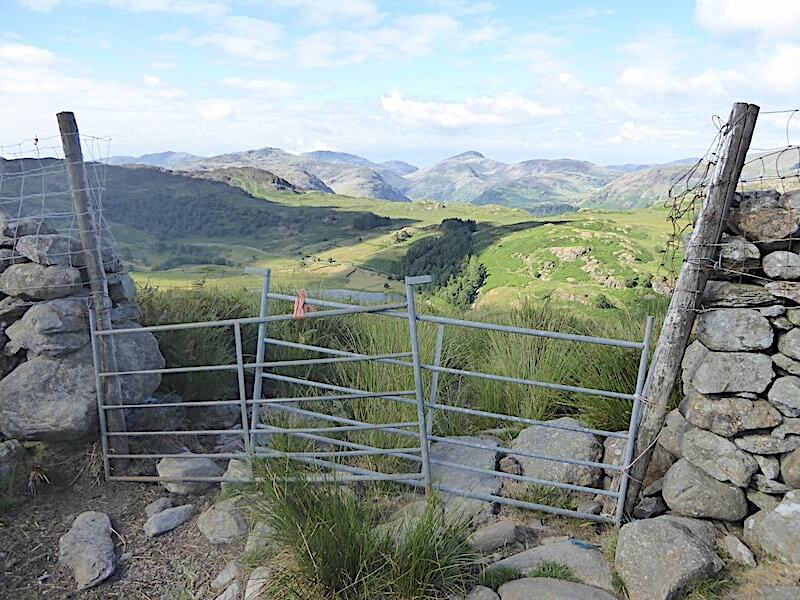 We go through the first gate, ignore the one in the wall to the left and follow the nicely graded grassy path round and on up the hillside. 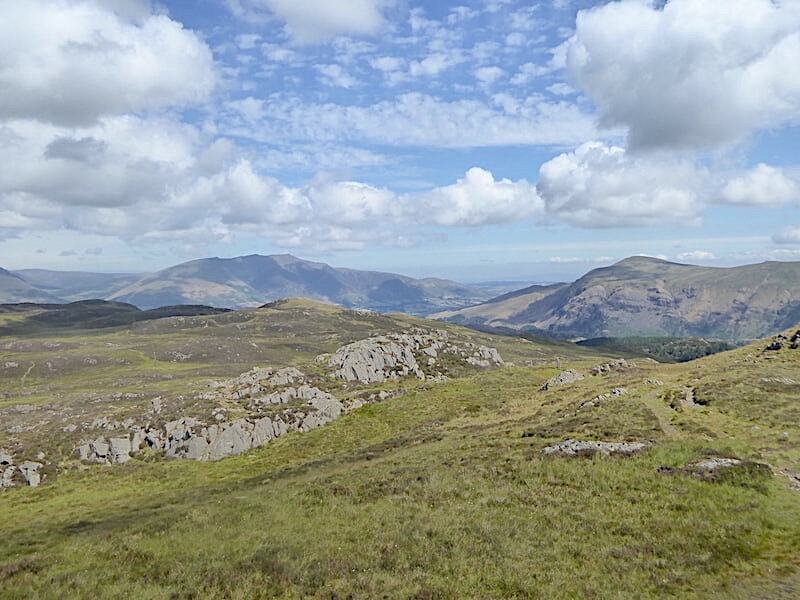 A look back to Ether Knott from the initial stages of the grassy path. 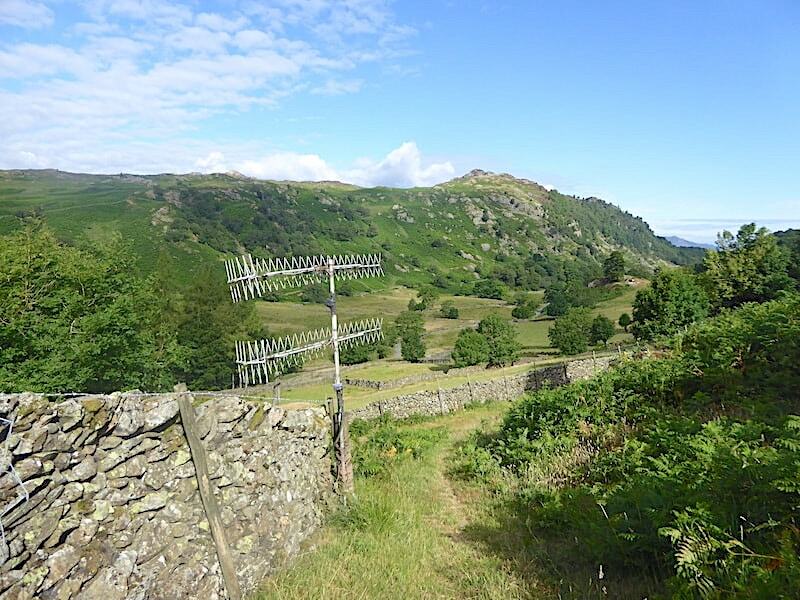 The path curves up alongside a wall and passes this tv aerial on the way. 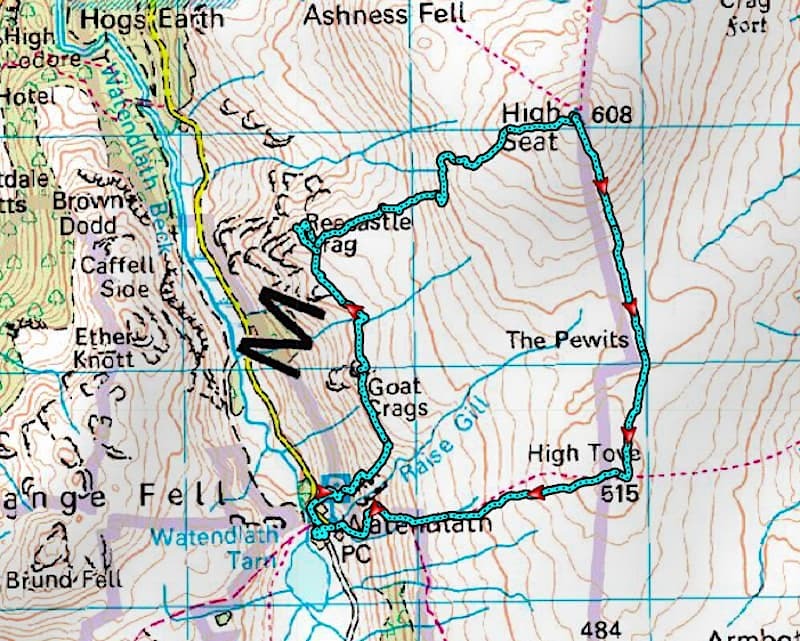 AW’s drawing on High Seat 5 also indicates an aerial but this isn’t it, the one he referred to is to be found a little higher up the fellside. 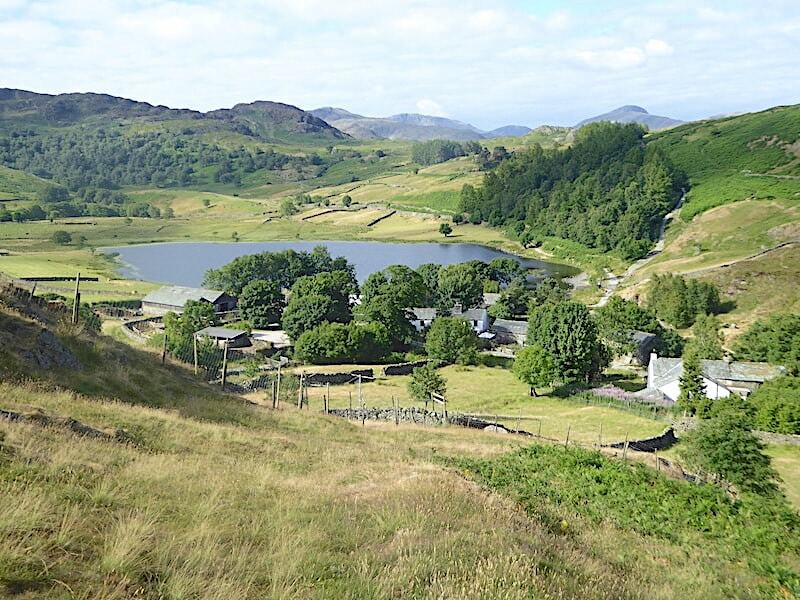 A look back to Watendlath and its tarn as we follow the grassy path upwards. Its a lovely morning but today the air is a little cooler and fresher than it was on our last walk so the climbing isn’t as uncomfortable as it was on that occasion. This is the probably the aerial shown on AW’s diagram although it cannot be the same one he saw. In those days he would have seen one of the H or X shaped aerials which sprouted from most rooftops and chimney pots then. Viewers over a certain age will no doubt remember them. We only had BBC and ITV, both transmitting programmes in black and white, to choose from when AW was compiling Book 3, how things have changed. 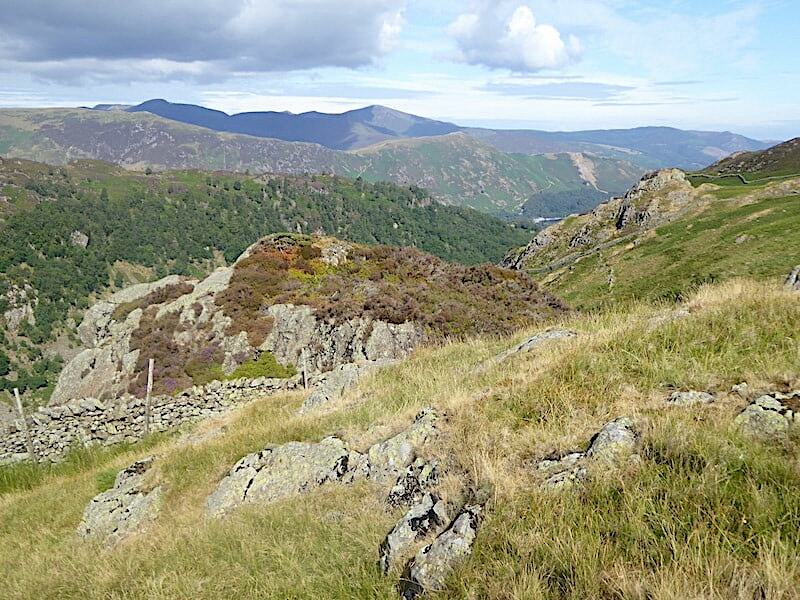 Behind the aerial we have a view of Goat Crags which will be our first port of call once we are a little higher. 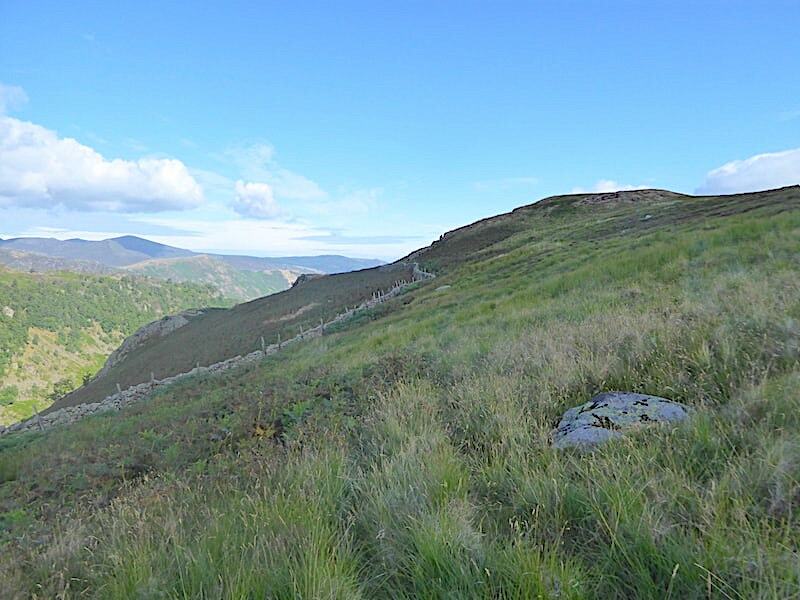 The path passes near to the left hand side of Raise Gill’s deep ravine but a peep down into the ravine was not to be had as a fence was barring the way. Still, it was a good point at which to take a look back down at the tarn. The morning sun was lighting the distant fells nicely so I took a few close ups. 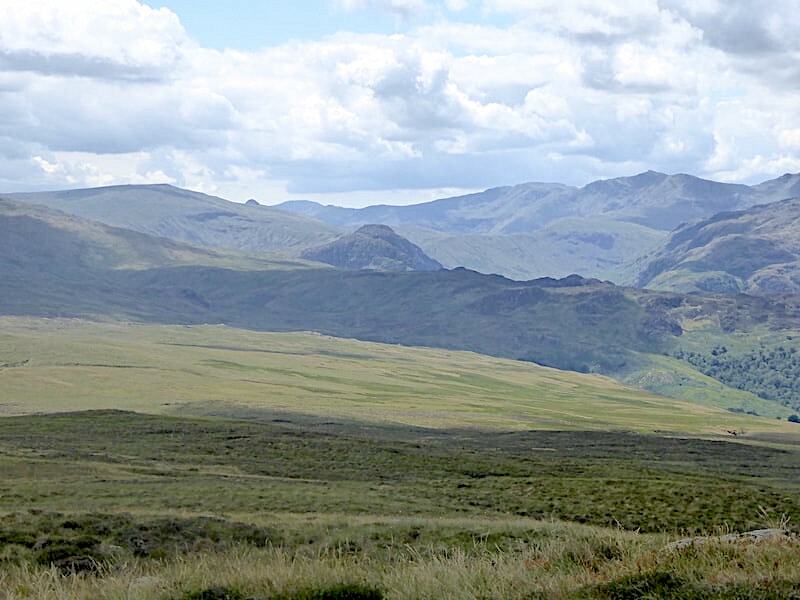 On the left skyline is Glaramara, followed by Great End with Scafell Pike just behind it, then comes Lingmell and Great Gable over on the right. 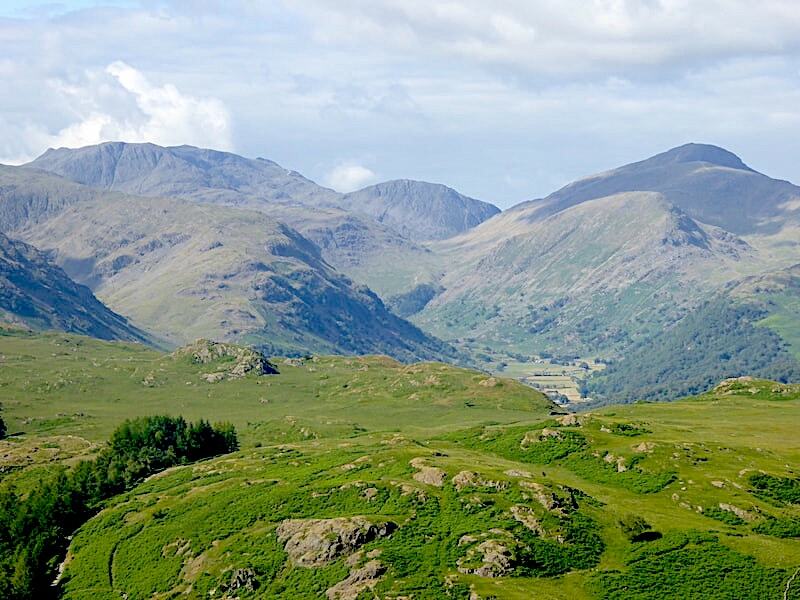 Great Gable, in shadow, with Green Gable, in the sun, just below it with the long sweep over to Brandreth and Grey Knotts over to the right. 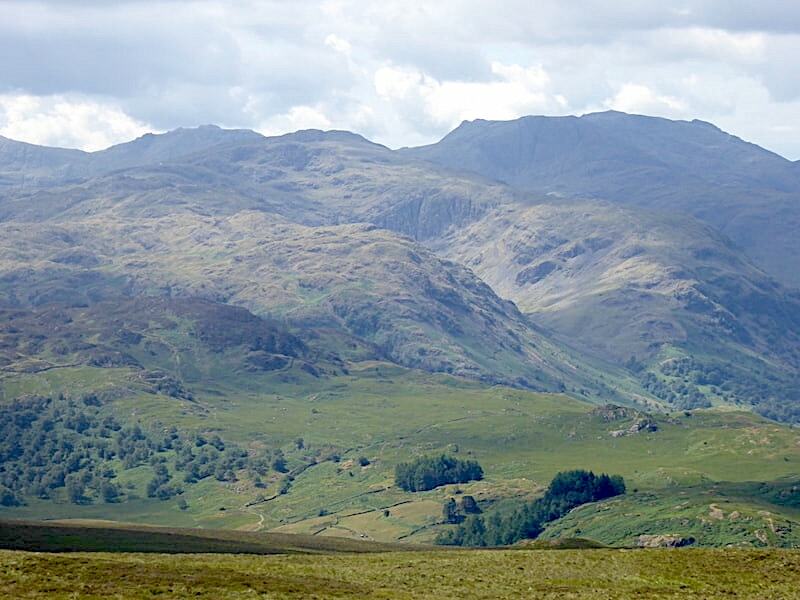 Below them is Base Brown, to the left, and Seatoller Fell to the right, with the hanging valley of Gillercomb, surrounded by all of them, in the centre. Lovely to look at at any time but especially with no cloud clinging to them and from a different aspect. 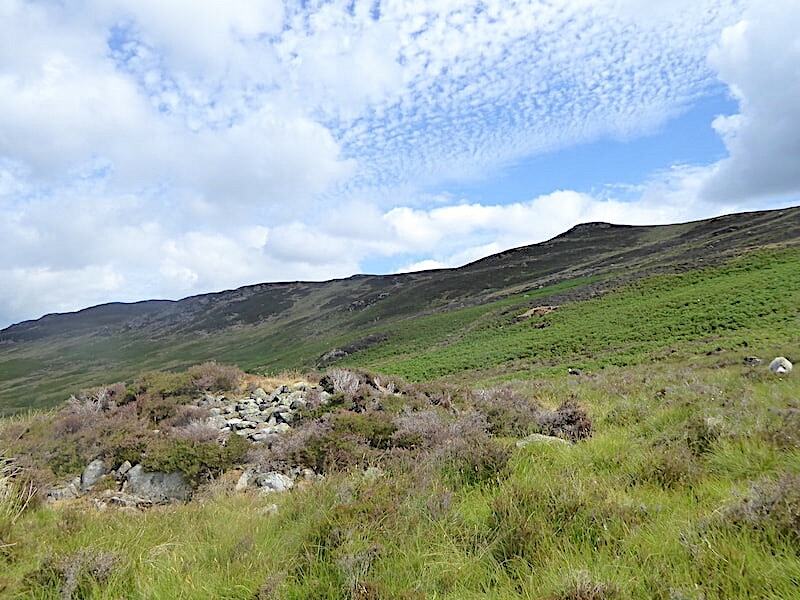 Further to my right we have Dale Head and the High Spy – Maiden Moor ridge. 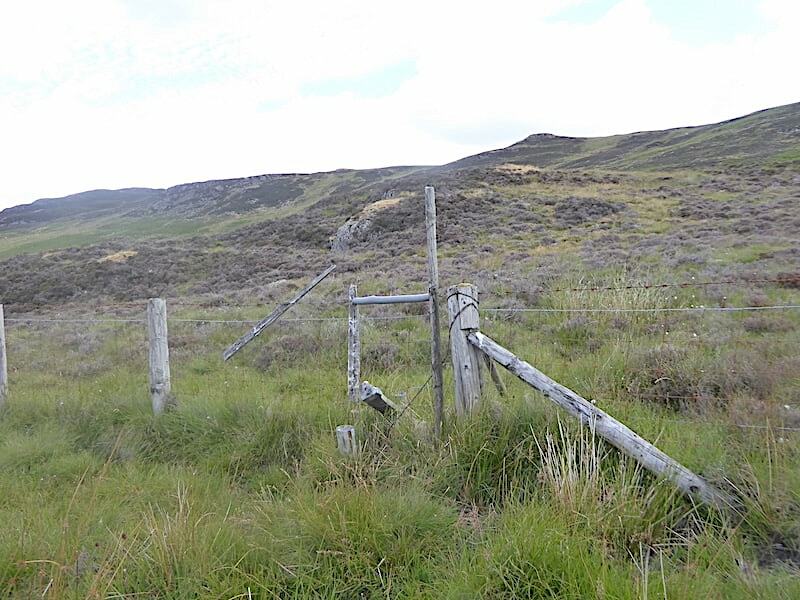 The wall crossing was this ramshackle arrangement of two fence sections held closed by baler twine. We didn’t bother unfastening them, it was simpler and quicker to just climb over. 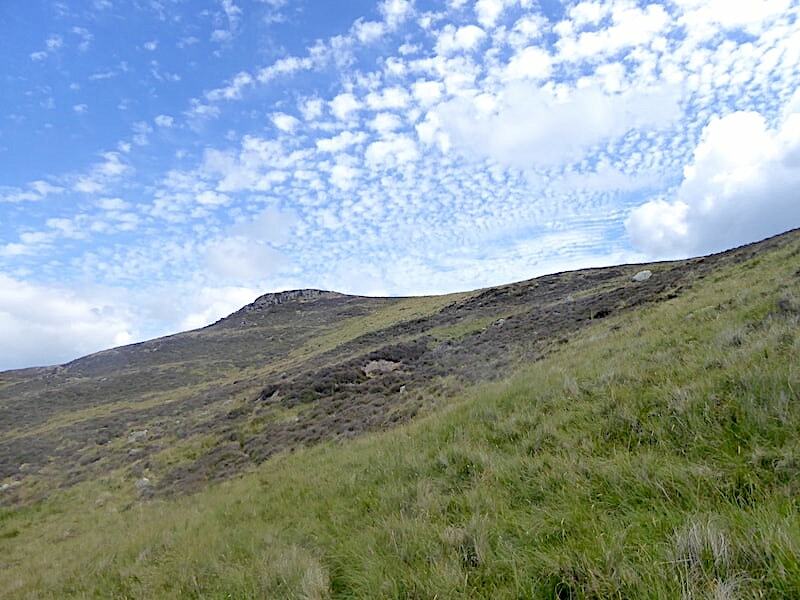 Once over the wall we have a long grassy traverse over to Goat Crags and then on to Reecastle Crag. 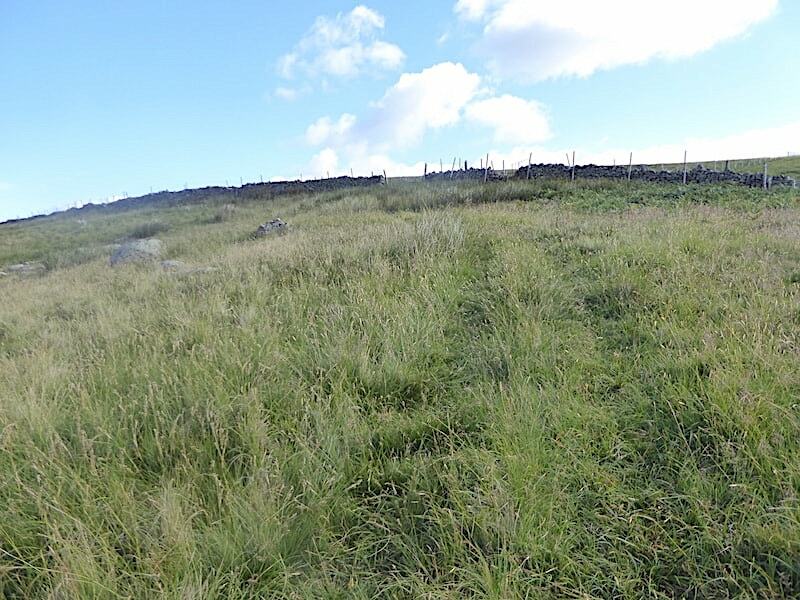 The grass is long and there isn’t a path as such but the quad bike tracks continue so we use those. Its a bit uneven here and there but there’s nothing really uncomfortable to deal with. 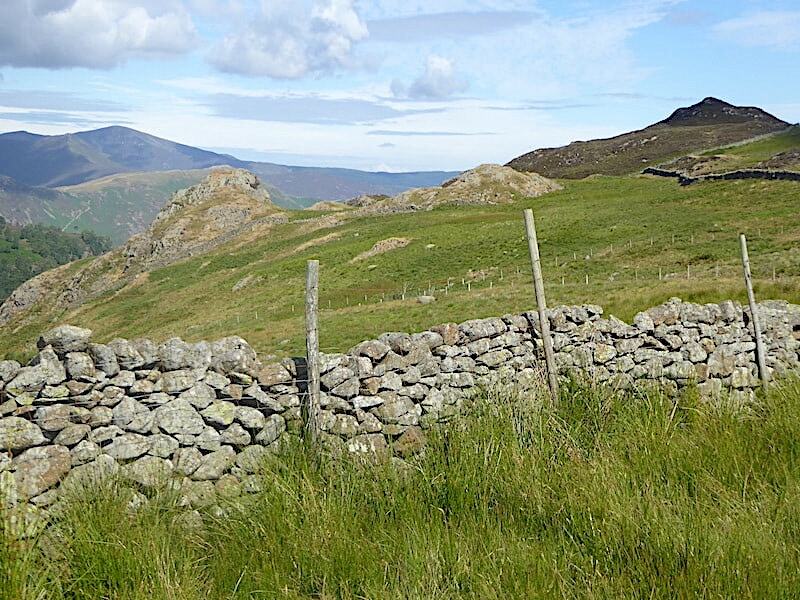 A steady walk across eventually brings us closer to the many outcrops comprising Goat Crags, most of which are surrounded by walls topped with higher fencing which keeps the sheep out of harm’s way. 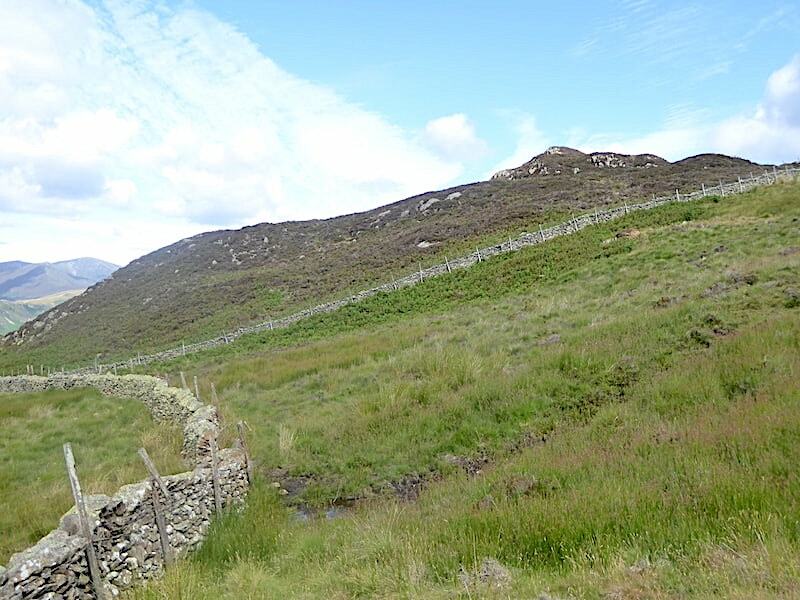 A look back at our route so far, mostly following the quad bike tracks, and the occasional sheep trod, a little way above the wall. Very pleasant walking if a little tussocky at times. 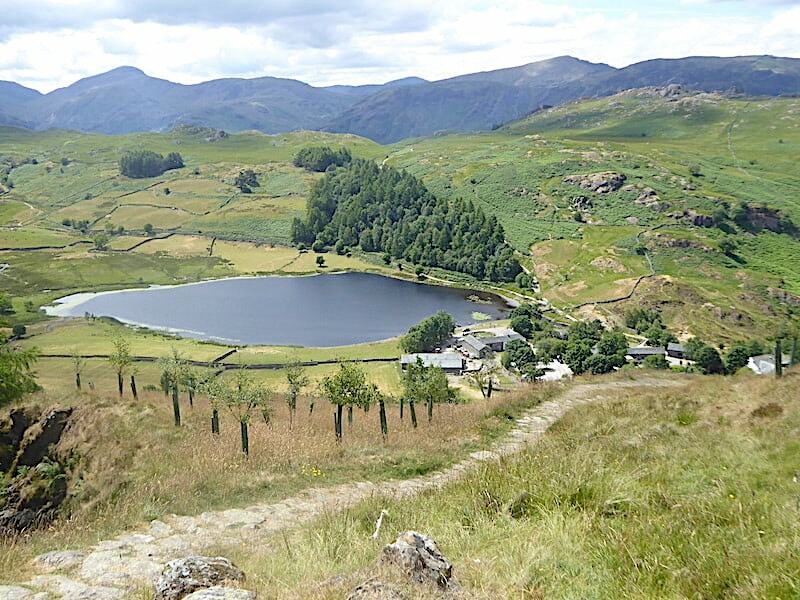 From the top of one of the outcrops a view down to Watendlath Tarn with Great Crag just beyond it. 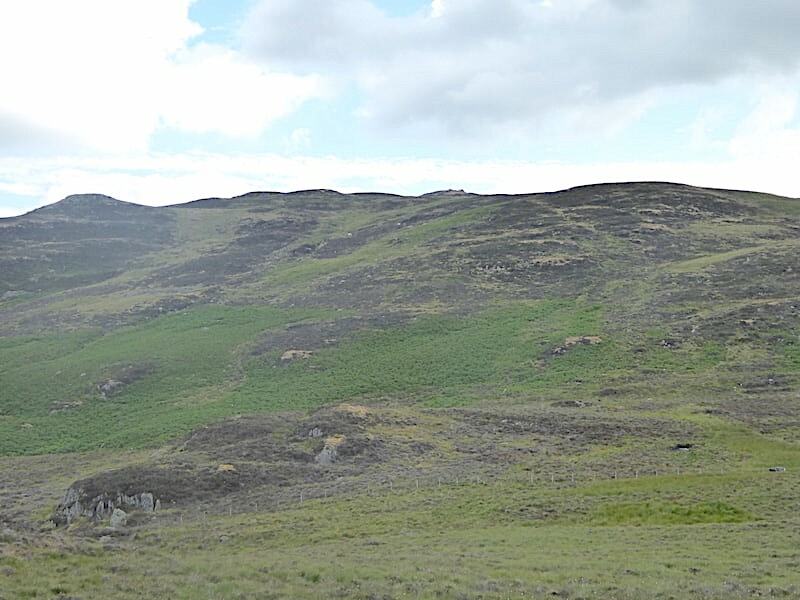 Great Crag will be dressed in its purple best in a couple of weeks when the heather comes into bloom. 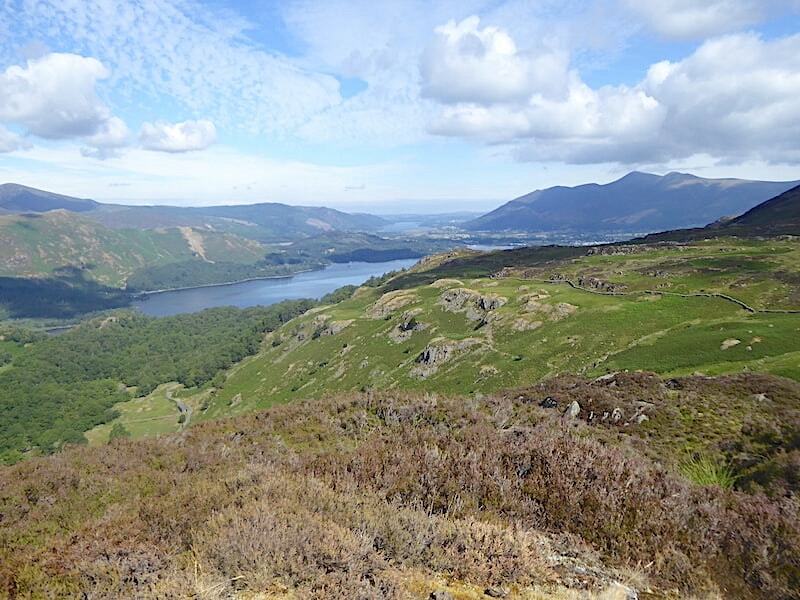 A grand view over Borrowdale on a lovely morning. 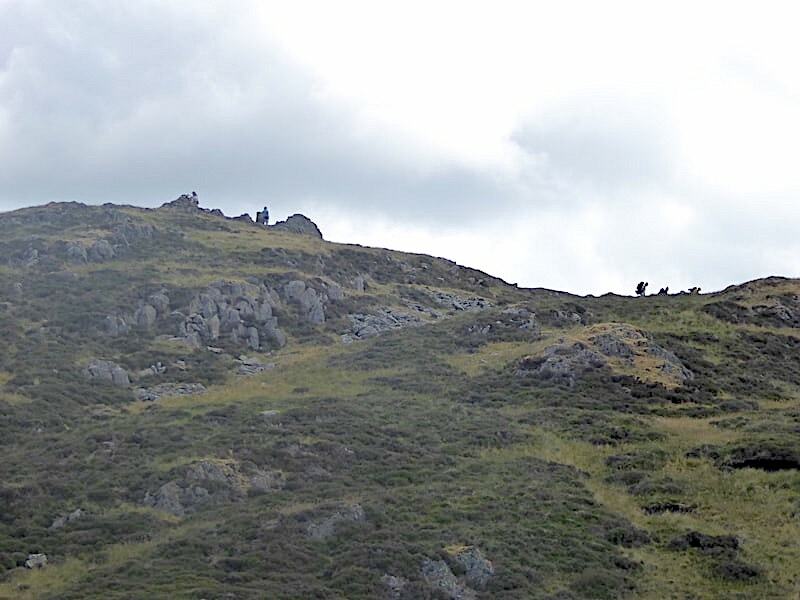 We’re still passing above Goat Crags but now Reecastle Crag appears on the skyline …..
….. and over to our right is the summit of High Seat on the right skyline. 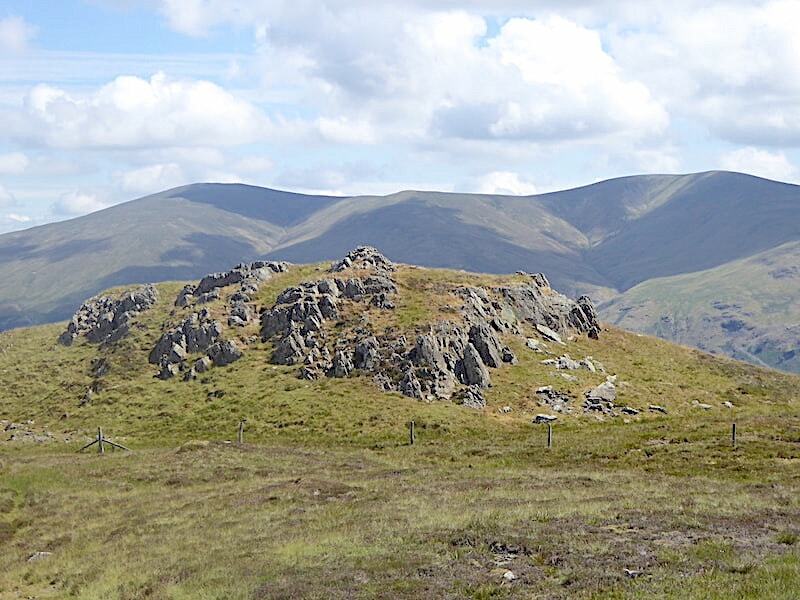 The small peak in the centre is Pouterhow Pike and to the left of that the ridge continues on to Bleaberry Fell. Some large clouds had now arrived so the lighting conditions were changing by the minute. 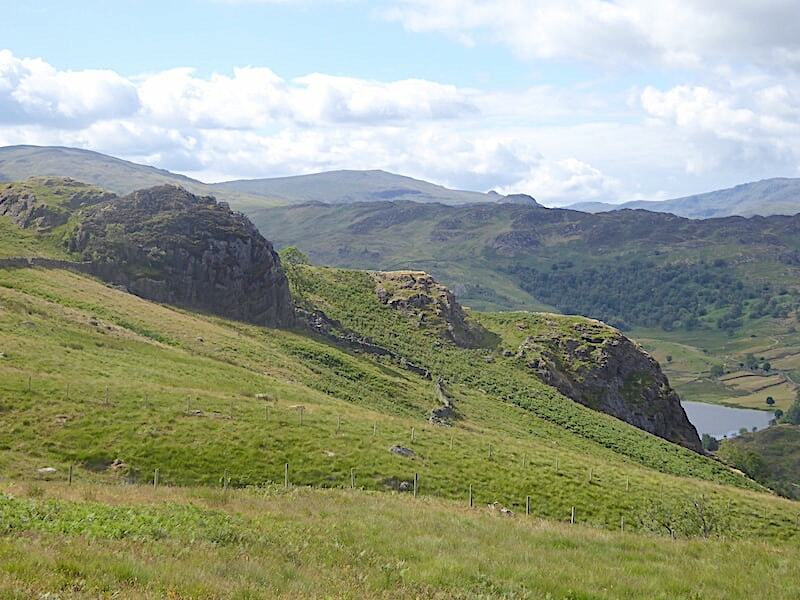 Below is a a section of Goat Crags which are quite an awe inspiring sight when seen from the Watendlath road. 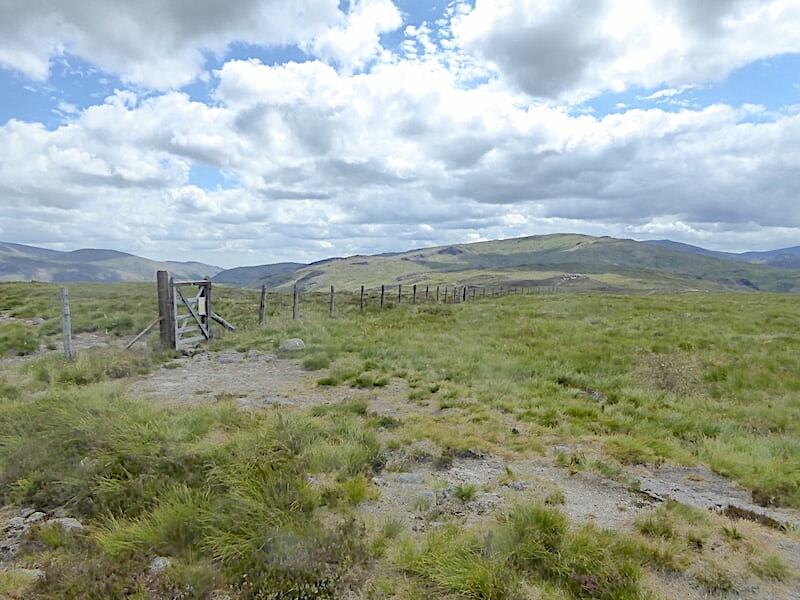 The green fell opposite is Grange Fell with a couple of its high points, Brund Fell and Jopplety How, on view. 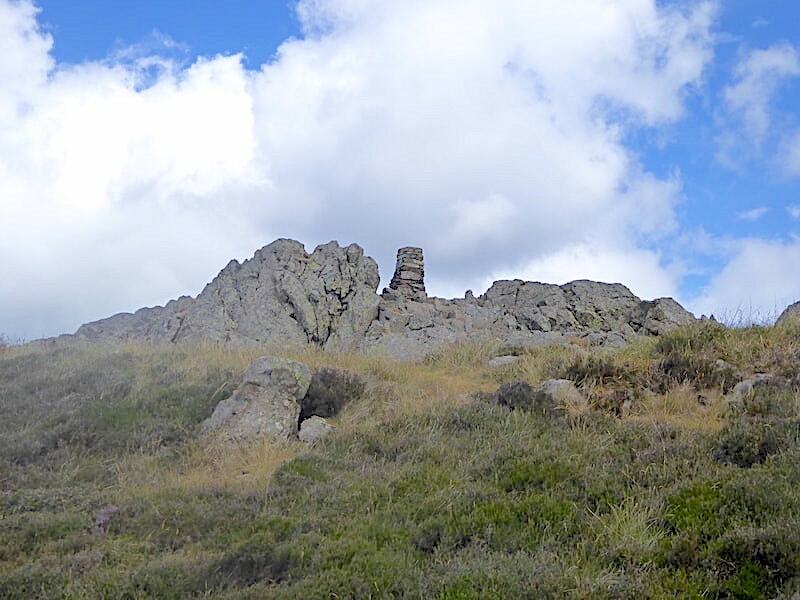 More of the rocky tors which make up the extensive area covered by Goat Crags. 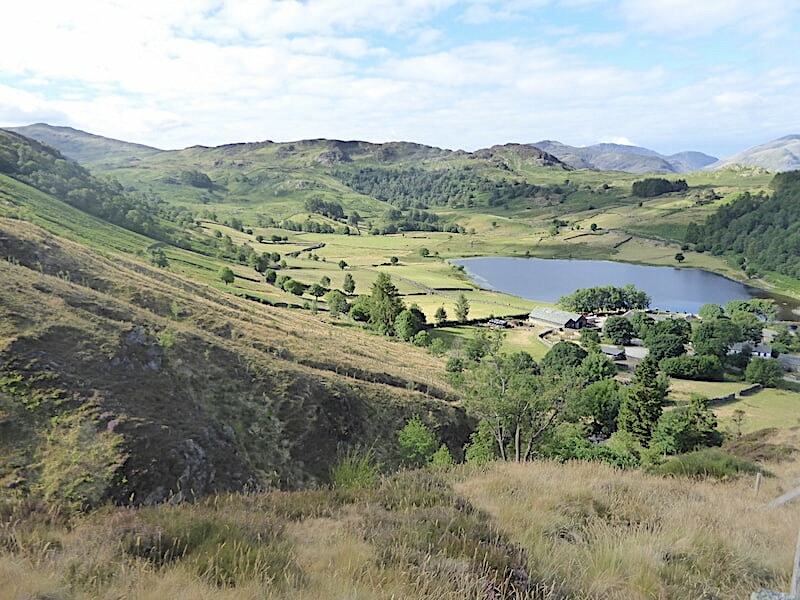 A look at Reecastle Crag ahead …..
….. and then we drop down from the high point and carry on following the wall once more. 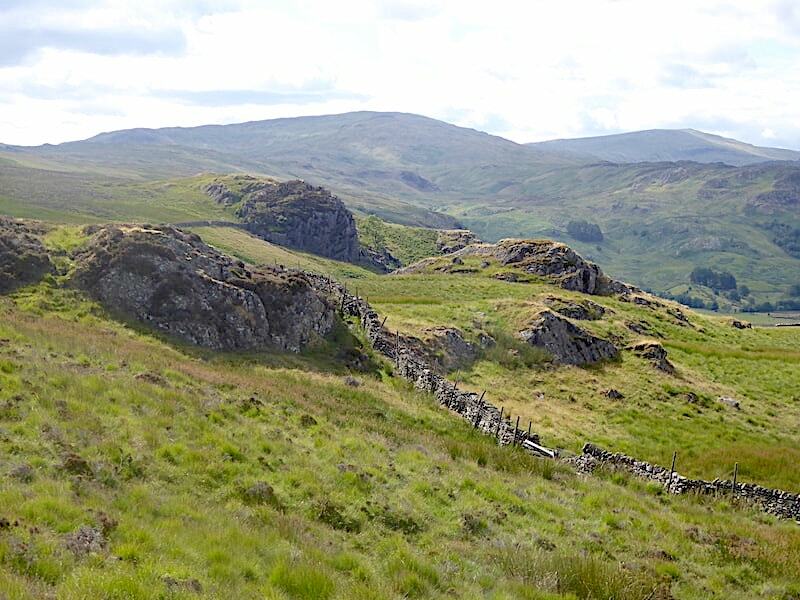 Back at the wall, where the grass seems to be even taller and the quad bike tracks have disappeared temporarily, and another look ahead at more rocky tors with Reecastle Crag beyond them. Another gate to pass through and the absence of any grass flattened by feet suggested that it hadn’t been opened for quite a while. 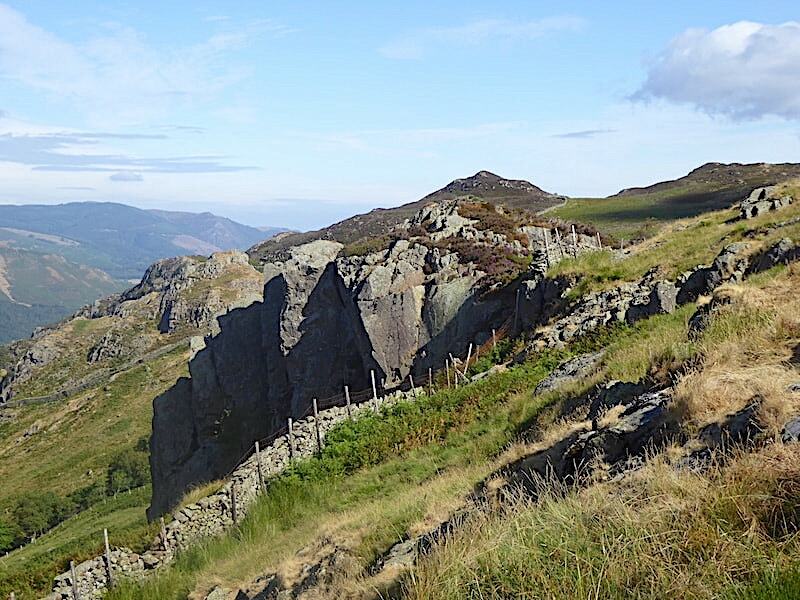 We’re well beyond most of Goat Crags at this point so I took a look back. On the left is the high point from where I took some of the previous photos and the wall we are now following is the one on the left of the shot not the one in the centre. 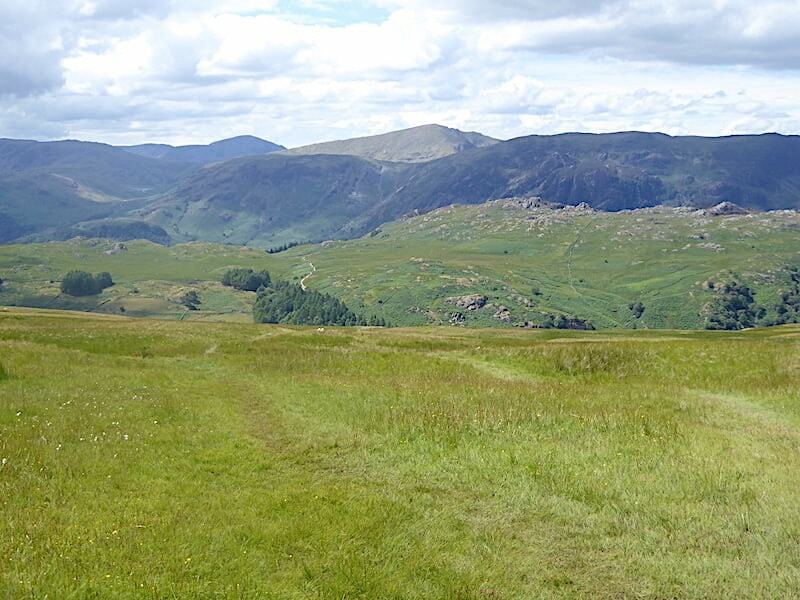 Just ahead, towards the bottom of the photo, is practically the only moist part of the whole walk. A small spring was just about managing to dribble out from a little further up the hillside, out of shot on the right, and then seemed to come to a halt in the little puddle beside the wall. 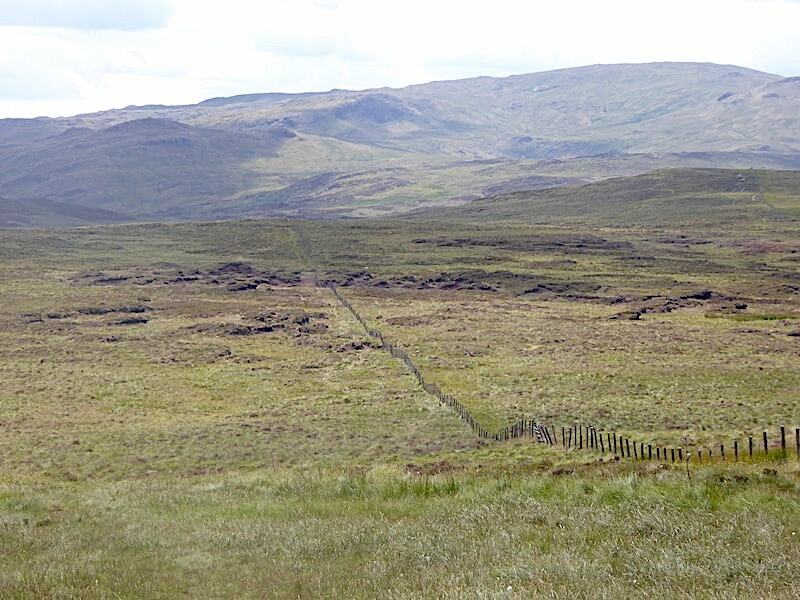 It was around this point we left the wall and began to cross the slope making for the wall below Reecastle Crag. 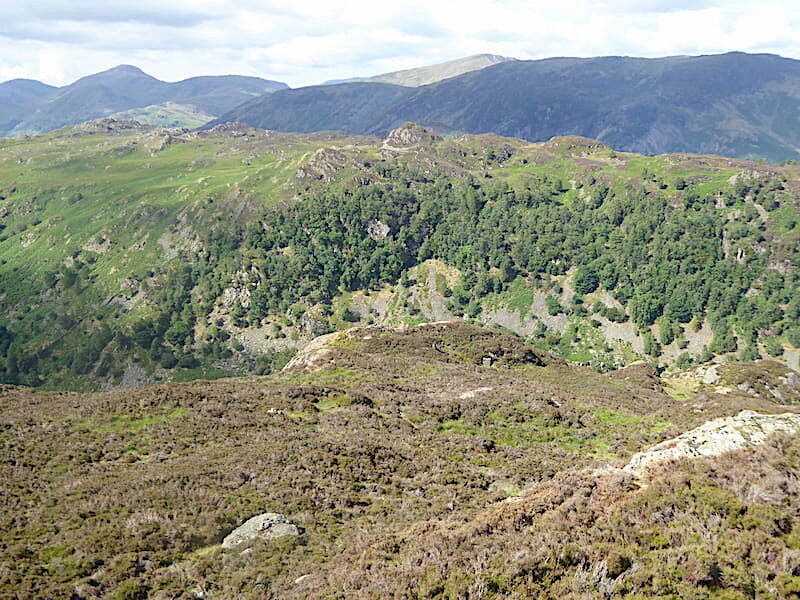 A good spell of sunlight lit up Goat Crags behind us so I took a couple of shots as we climbed. 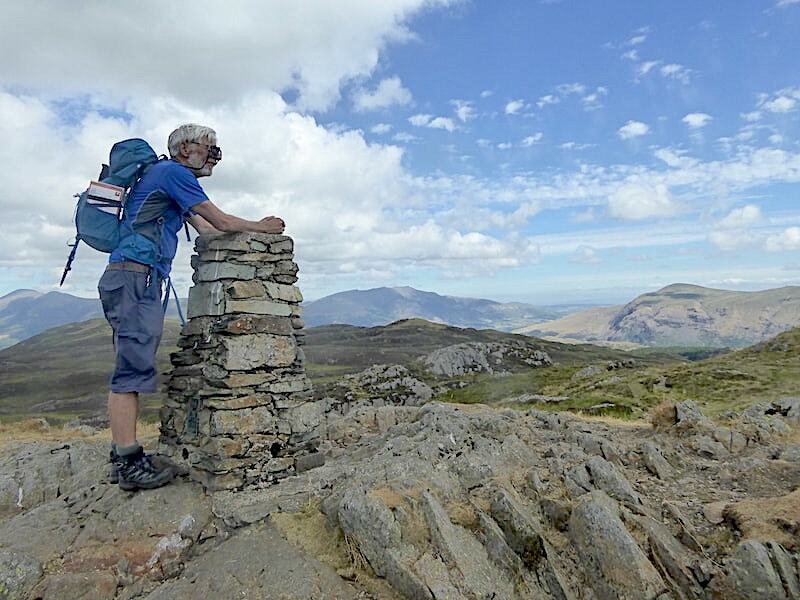 There’s a whole lot more to Goat Crags than the view you get from the Watendlath road. 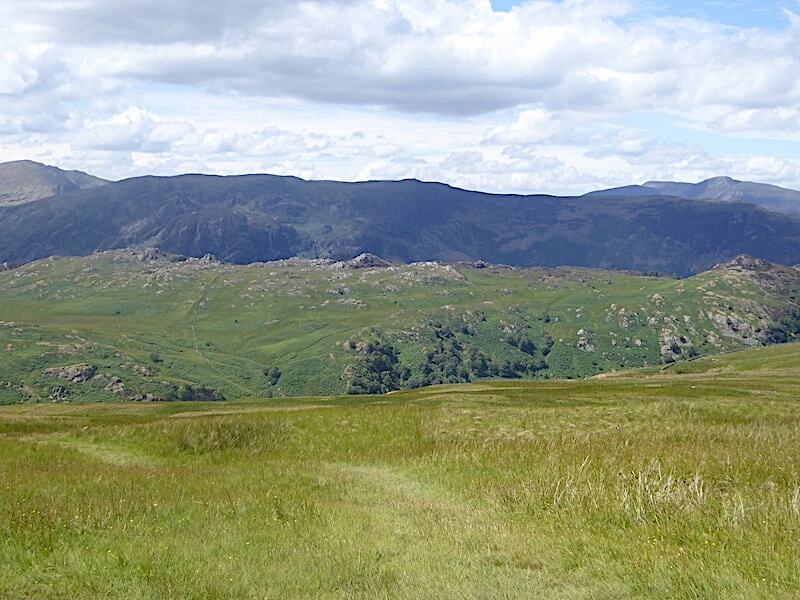 We’ve climbed up beside the wall around Reecastle Crag and here we’re at the little col between it and the next rise. 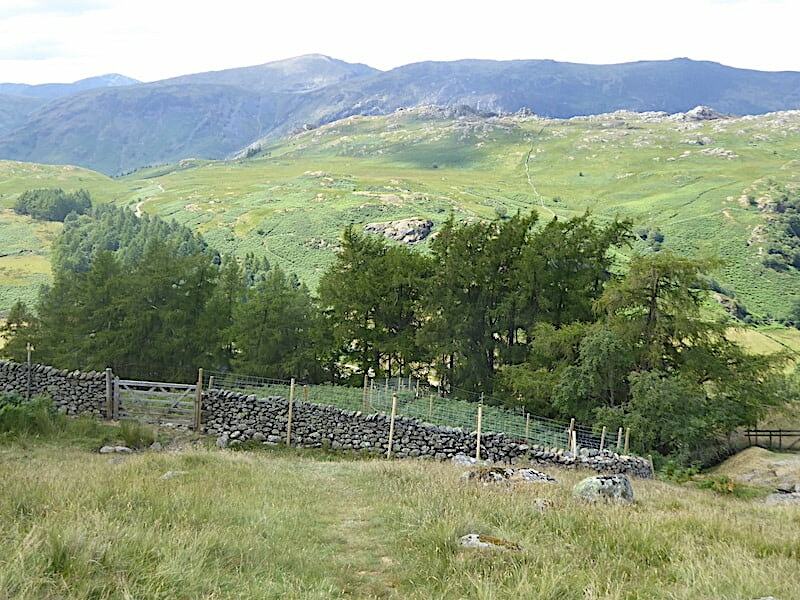 You get a fine view of the Skiddaw group and Bass Lake from here but we wanted to get up onto Reecastle Crag so we searched around for any gaps in the wall and its high fencing. There are a couple, one a little lower down from this point and another just a little way behind us. At both points the wall has partly collapsed so it wasn’t too difficult to pass through, although taller walkers might have to remove their rucksacks before attempting it. 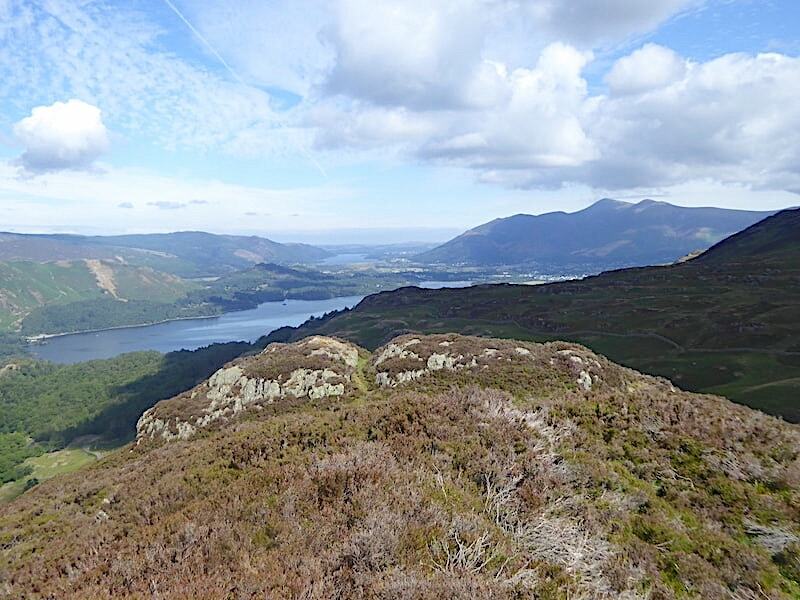 The view from the lower top of Reecastle Crag with Derwentwater and Catbells now included and …..
….. a little further to my left some of the north western fells appear beyond Catbells. Not content with the lower top we clamber through the heather to the higher one and take a look back at it and the rest of the view. 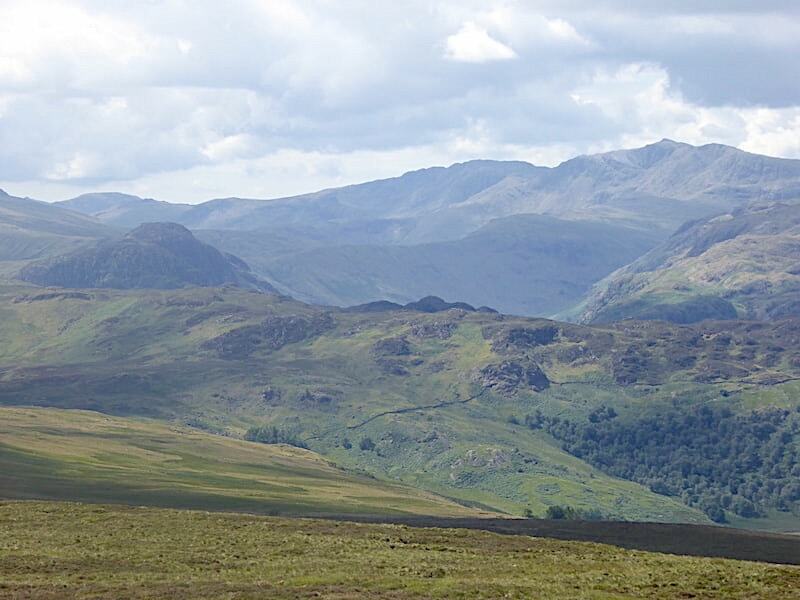 Below us are some of the lower points of Reecastle Crag, not looking quite as threatening as when seen from the road. 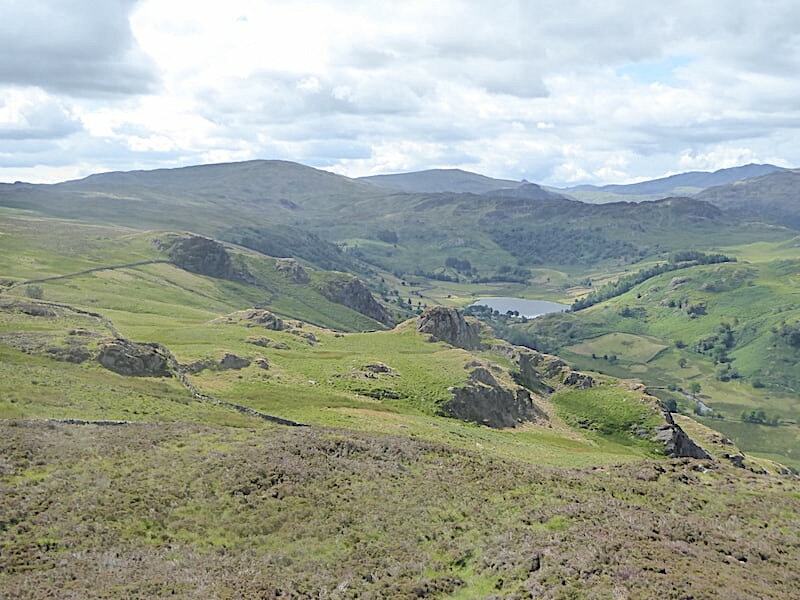 The view southwards across Goat Crags towards Watendlath Tarn from the top of Reecastle Crag. There was once an ancient hill fort up here, of Iron Age date, but our untutored eyes could see nothing by way of obvious evidence. 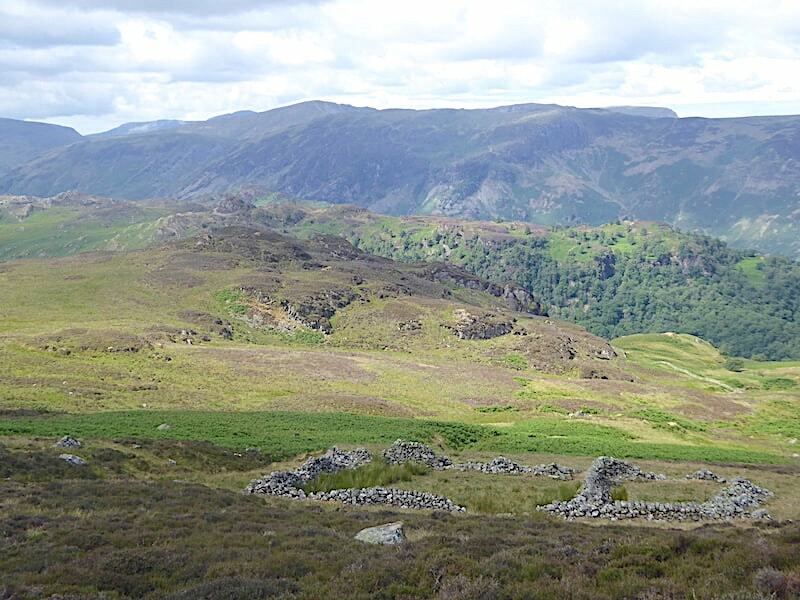 Reecastle Crag is been listed as a Scheduled Monument because of the rarity of this type of hill fort. From the top a look down across the little col and up towards High Seat. Everything is looking very dry so we shouldn’t have any problems as we make our way over. 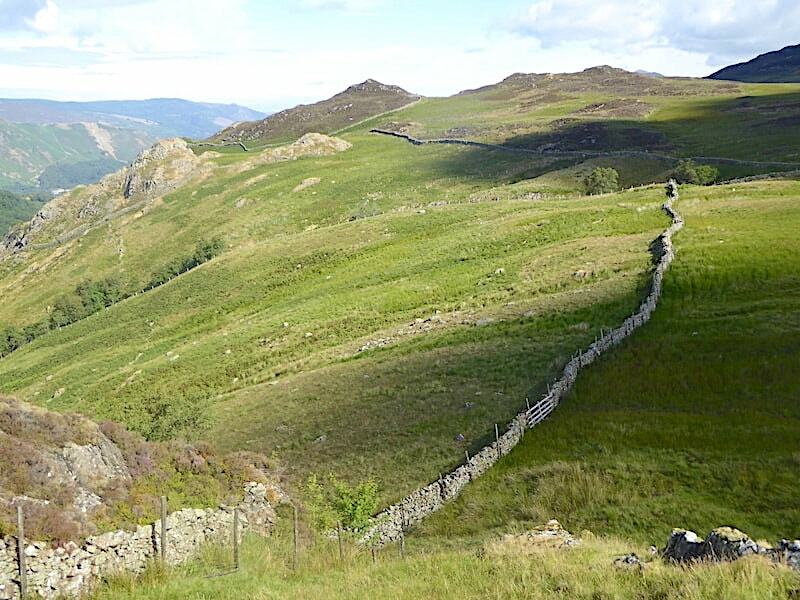 We drop down from Reecastle Crag, do a sort of limbo shuffle at the wall and begin our walk across to the fence towards the bottom of the shot. The stile in the fence has seen better days but somebody has at least sought to protect the more sensitive anatomical parts of the human body by placing a section of spongy pipe insulation around the barbed wire across the top, although one of the barbs had managed to work its way through the insulation, a closer look will reveal the danger point. The hand pole was a little wobbly too but a little care, and a lot of giggling, saw us over without serious consequences. 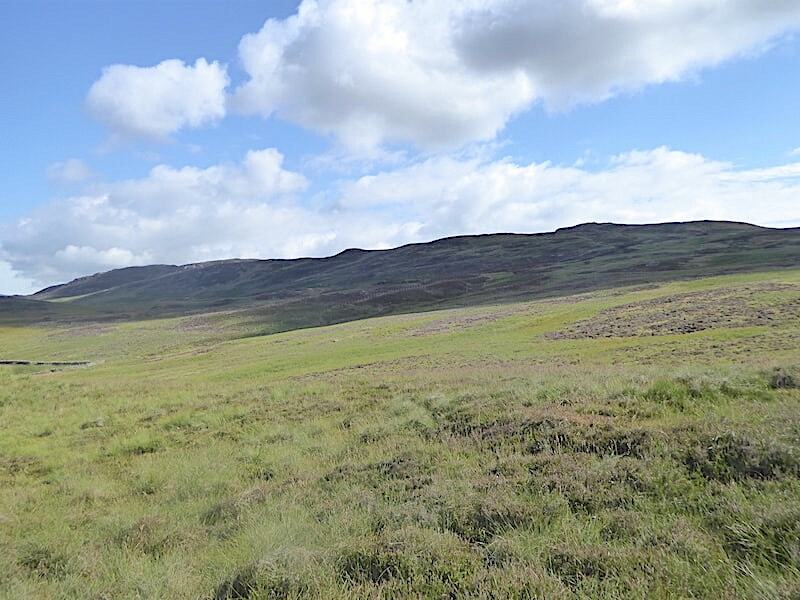 AW’s drawing indicates a mound of stones overgrown with heather at around the 1400′ contour, which he thought might possibly be a tumulus. We followed a line straight up from the stile and found it without any searching, so here it is. 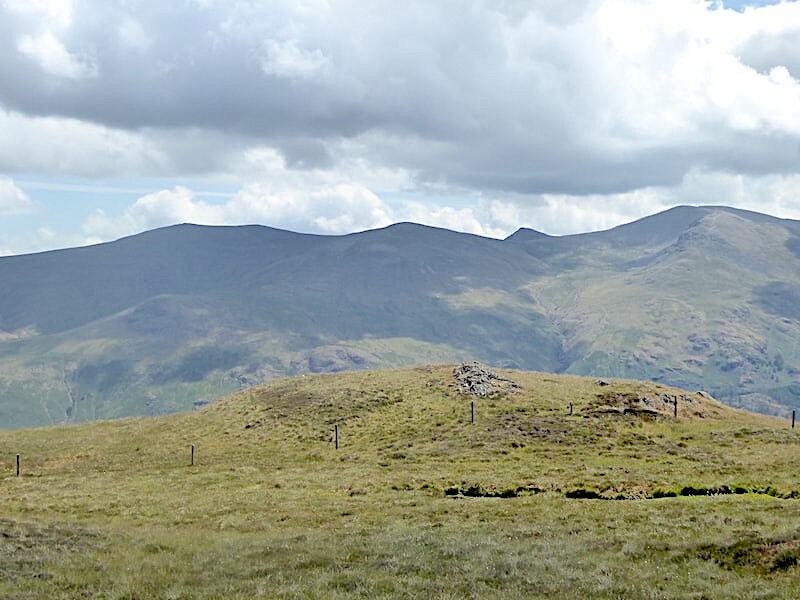 The peak up yonder is Pouterhow Pike, not to be confused with the summit of High Seat. 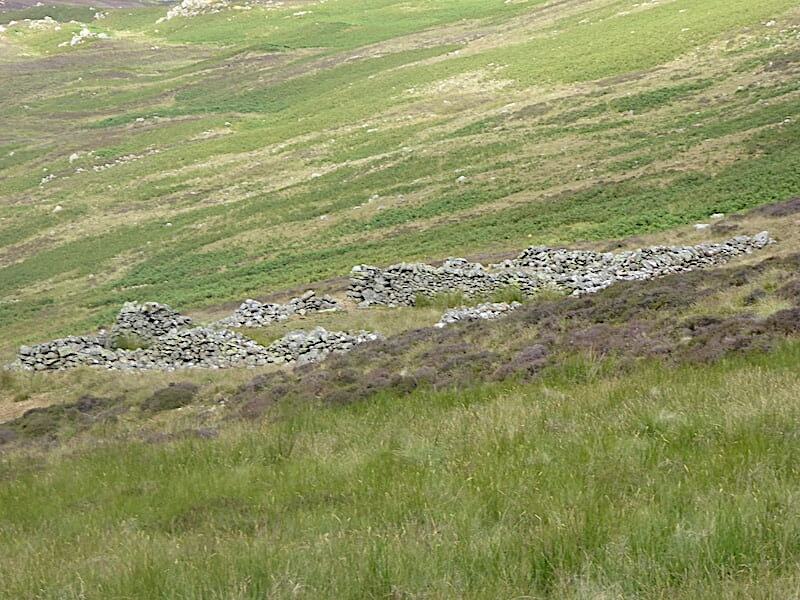 Now we’re setting off to look for the ruined sheepfold which AW also indicated on his drawing. We took the drawing at face value and continued straight up from the mound of stones/tumulus thinking we would be roughly in the right area to stumble across it at the 1600′ contour. The kink on our route map, between High Seat and Reecastle Crag, veers southwards to begin with as we hunted around for it. 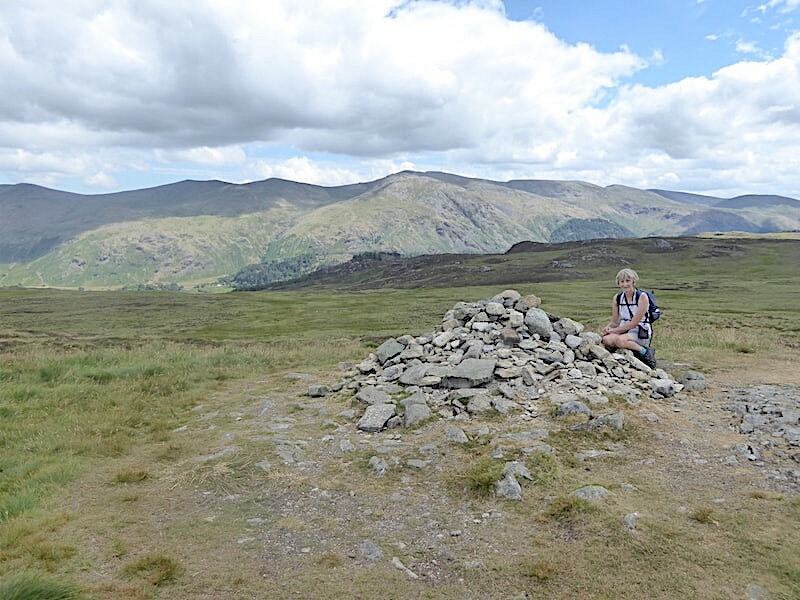 We could find no trace so we abandoned the search, turned northwards and headed for High Seat summit instead. As we were making our way over we suddenly saw the sheepfold a little way below us so we stumbled upon it quite by chance. Its a little more to the north of the mound of stones/tumulus than AW’s drawing suggests and its hard to spot from below. 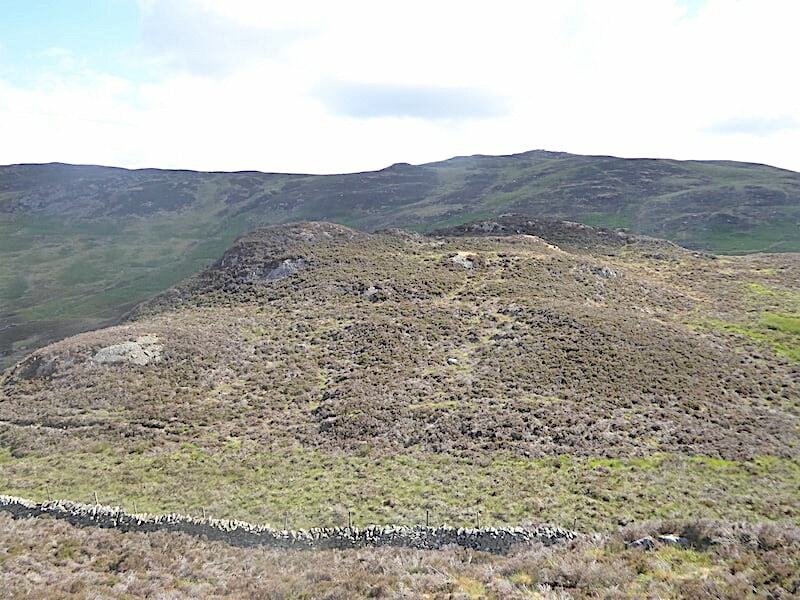 A look back down to Reecastle Crag from just above the sheepfold, the mound of stones/tumulus is out of shot to the left. 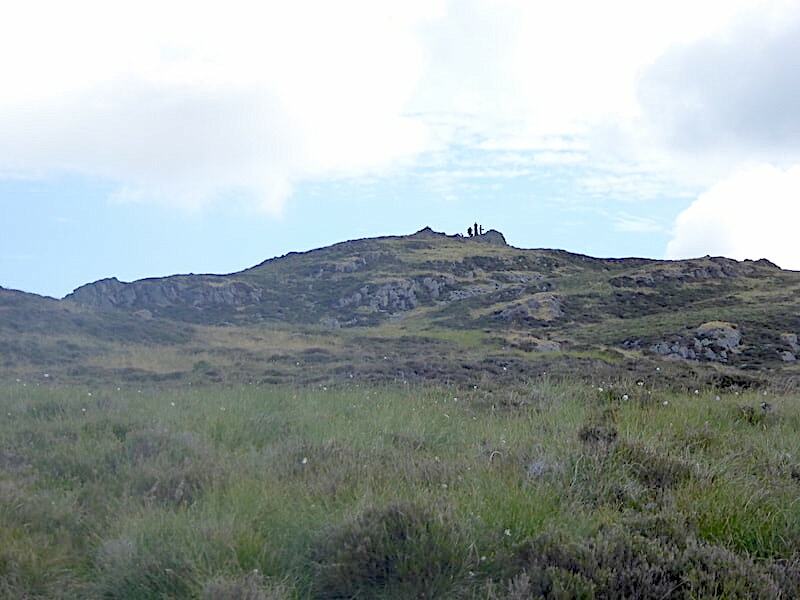 We carry on climbing up to the summit picking our way through the heather and outcrops with the views to the west opening up as we do so. 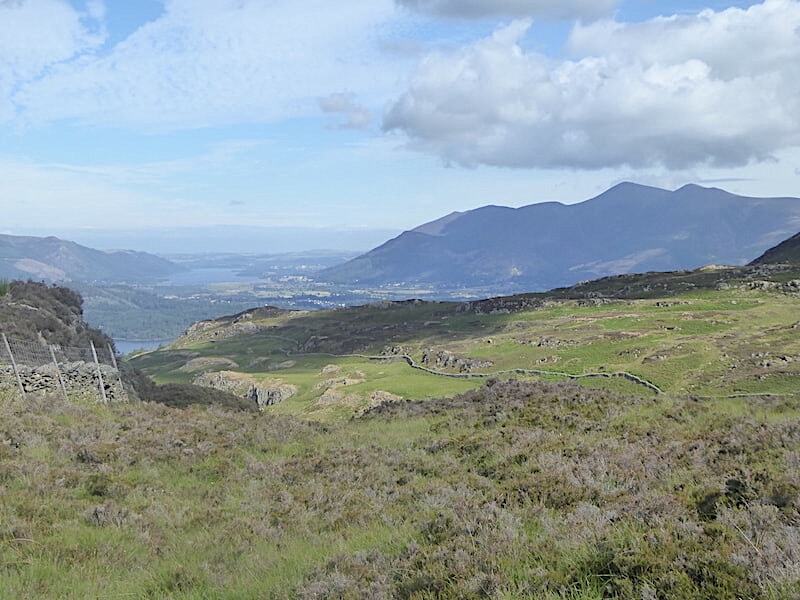 Across the middle of the shot is Hause Gate with Catbells to the right of it with an array of fells beyond. 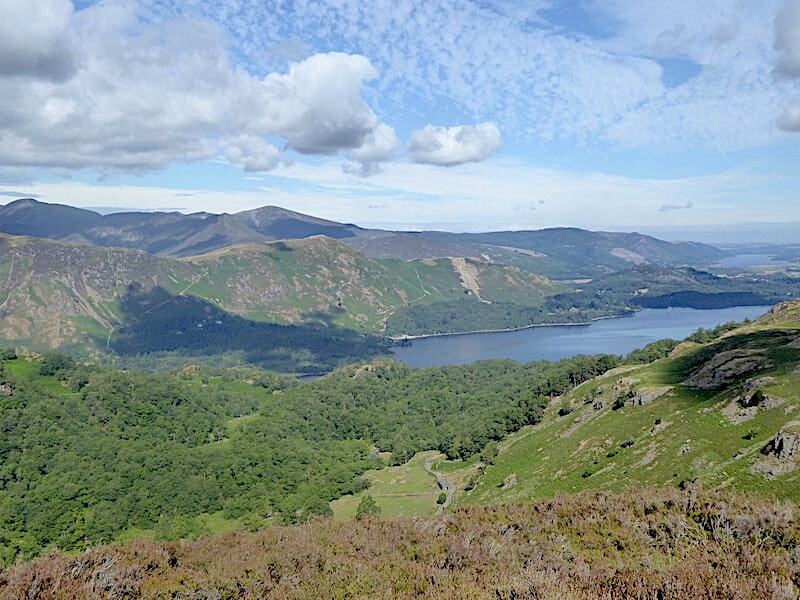 If you want to try your hand at fell spotting here’s a list, in random order, of what’s on view beyond Catbells:- Crag Hill (or if you prefer it, Eel Crag), Causey Pike, Grasmoor, Sail, Grisedale Pike, Ard Crags, Wandope, Barrow (part of), Hopegill Head, Scar Crags, Outerside (part of), Whiteside, Knott Rigg,, Whiteless Pike. 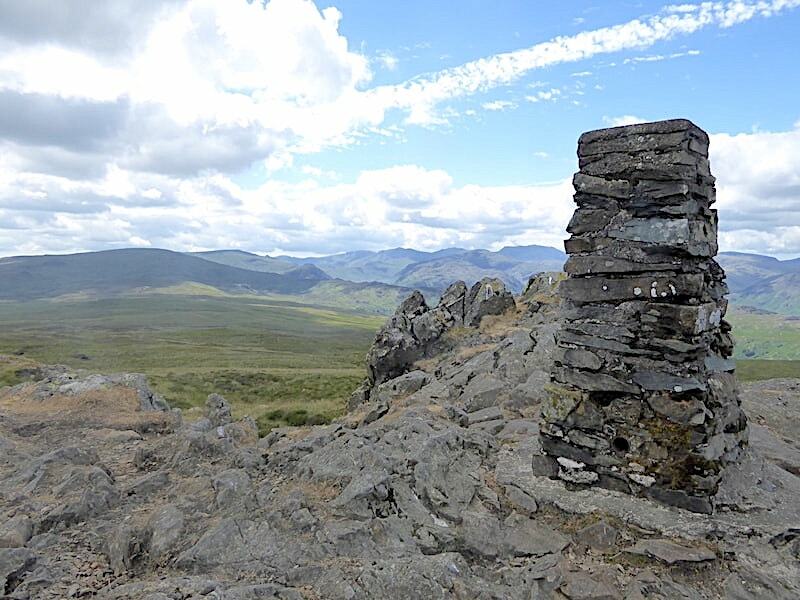 On High Seat summit are the first people we have seen since leaving Watendlath, these looked to be part of a larger group some of whom had already moved on towards High Tove. 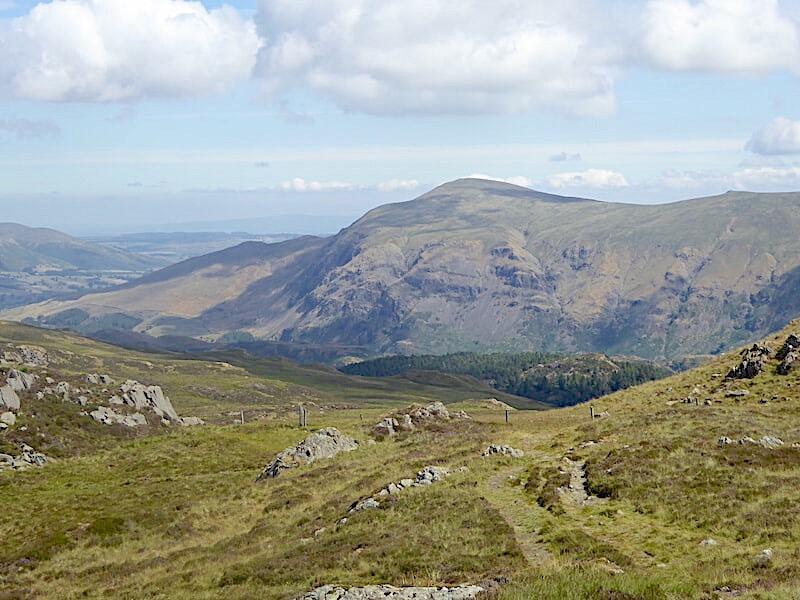 We’re not too far from the summit now so I take a look across Ashness Fell where, in places, the path leading across Dodd and down to Ashness Gill can be seen. I remember reading, somewhere or other, that this path was installed as a result of a bequest, the donor specifying that the money bequeathed should only be used to create this particular path. If I had the money to leave I’d specify that it be used to install one all the way from Bleaberry Fell to High Tove. I haven’t though so its no good getting your hopes up. 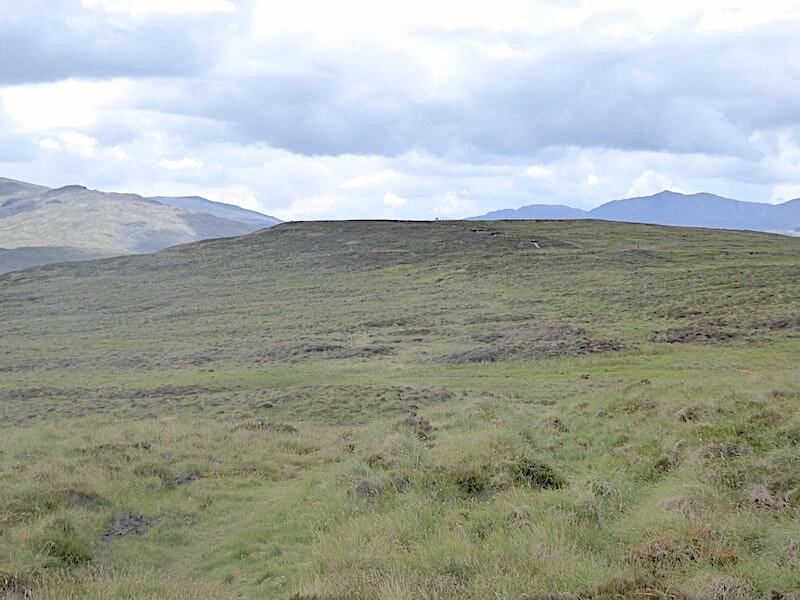 As there was still a clutch of walkers on the summit we held back for a while so I took a few more photos. By late morning the cloud had thickened and with the sunlight blocked the views were a little less clear than earlier on. Here we are looking at Ullscarf, on the left, and High Raise to the right. 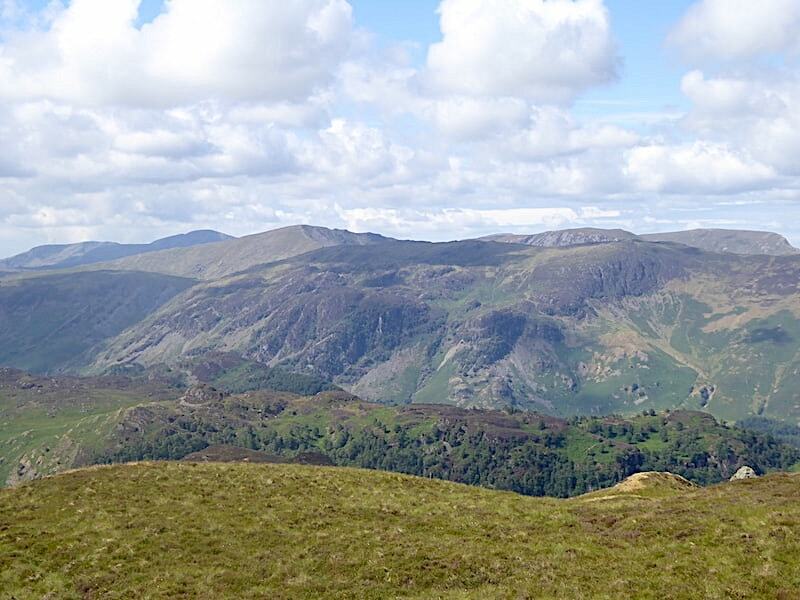 The little pimple to the right of High Raise is the topmost point of Pike O’Stickle. 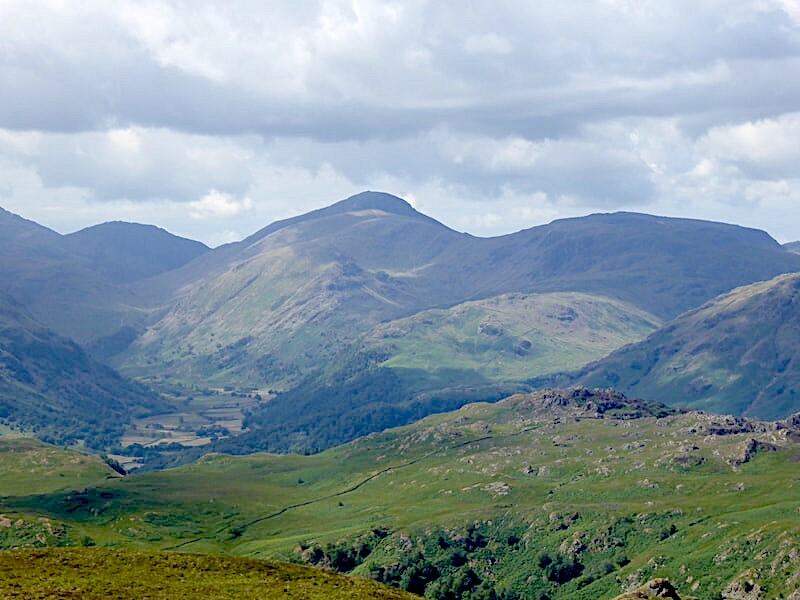 Cold Pike, Crinkle Crags and Bowfell on the skyline, the shadowy fell on the left, behind the ridge, is Eagle Crag. 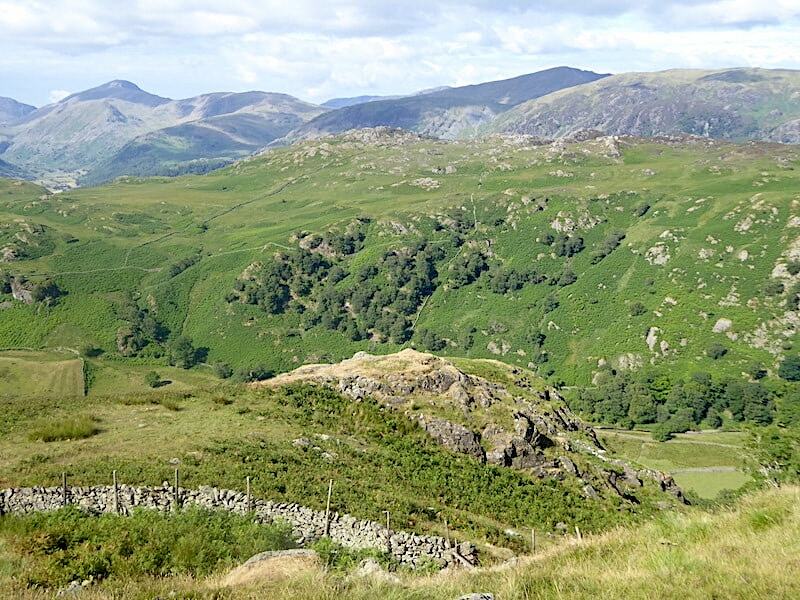 Looking towards a sunny Combe Gill with Rosthwaite Fell on the left and Thornythwaite Fell to the right. 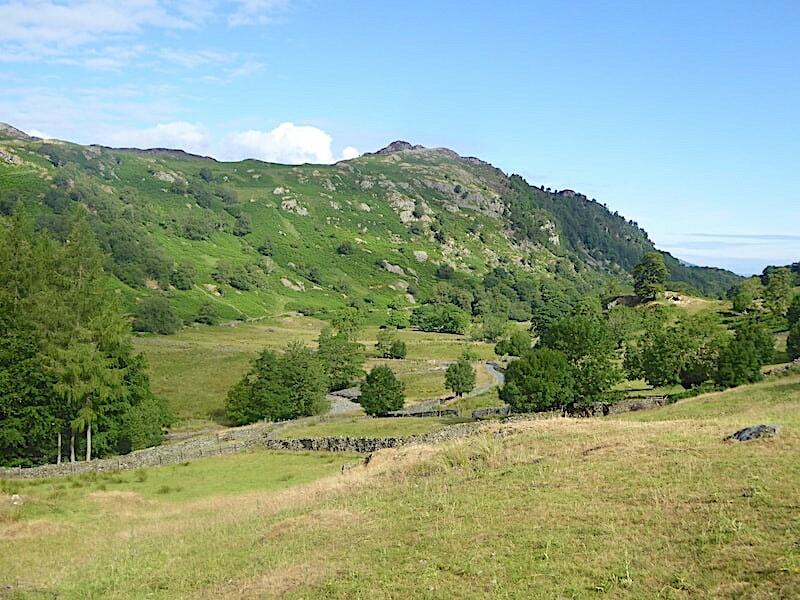 The Borrowdale fells still look impressive even in the shade. 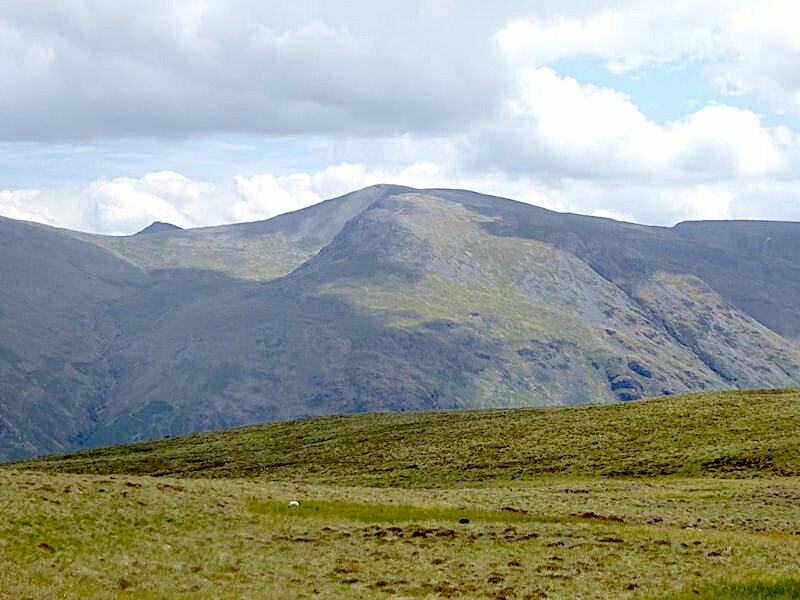 In the sunlight again for a clearer view of High Spy beyond the Grange Fell ridge, and beyond that are Dale Head, Hindscarth and Robinson. The last of the walking group take their leave and we begin to make our way up once again. 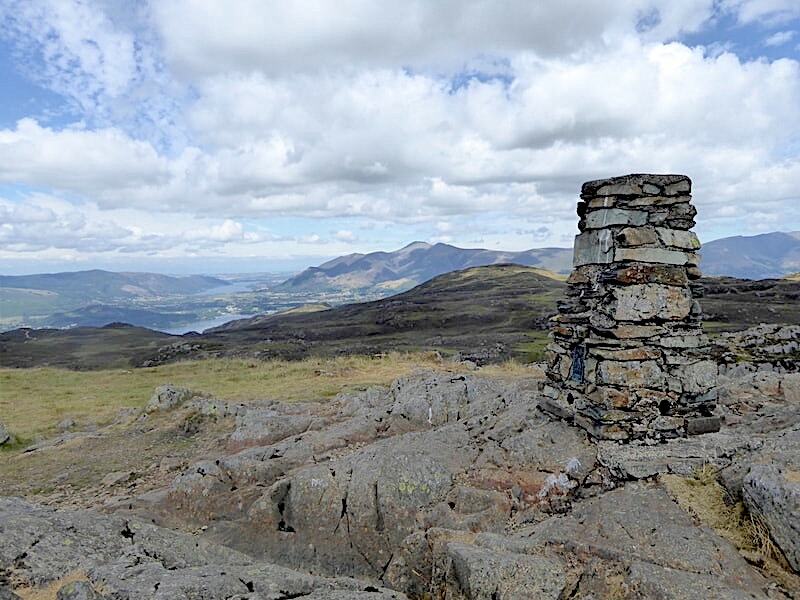 The trig column on High Seat’s summit. All clear as we arrived at the same time as one solo walker with whom we had a long chat. 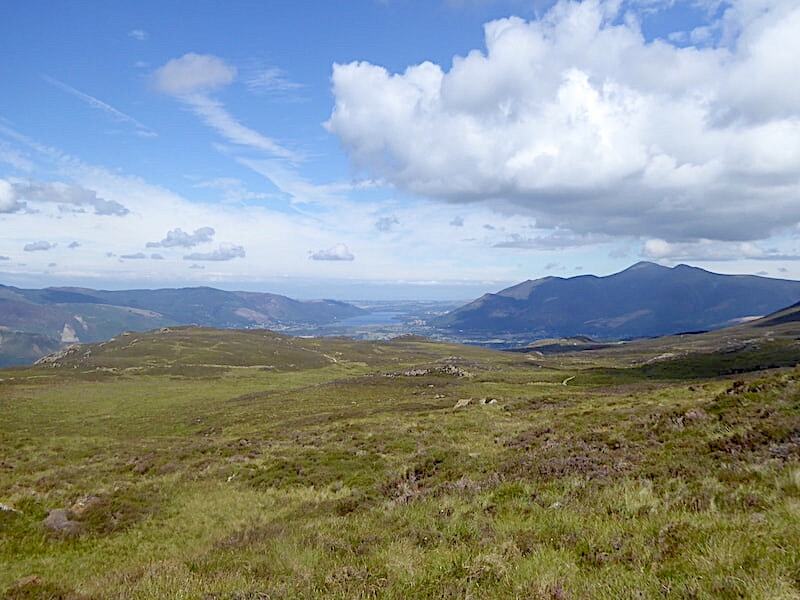 He and some friends were staying in Keswick for the week, he was walking alone today as the others had gone to Windermere. 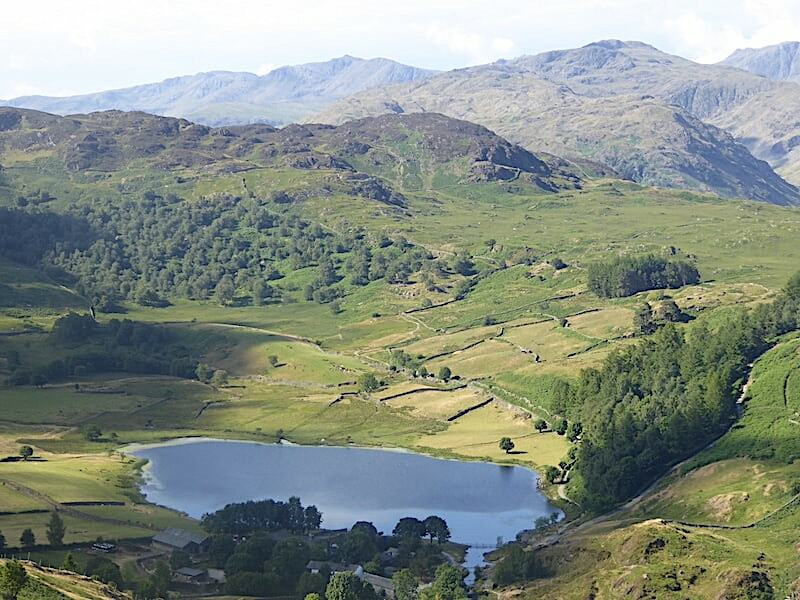 He said that they were also going to take the ferry and then drive up to Grasmere before returning to Keswick. I mentioned that the ferry was currently out of commission following an engine room fire and won’t be back in service until October so I hope he phoned them to let them know. Naturally the conversation turned to this evening’s match between England and Croatia so I wandered off and took some more photos. 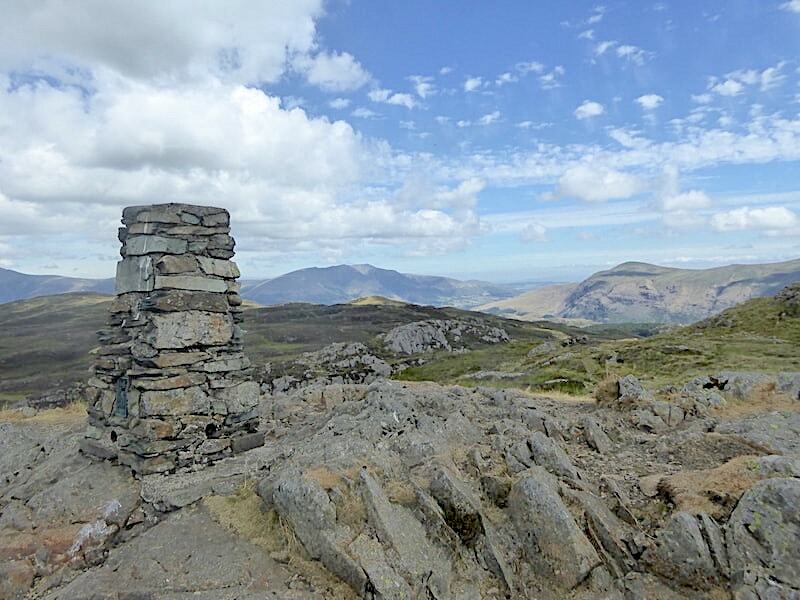 Here’s the summit cairn and the view to the north western fells beyond. 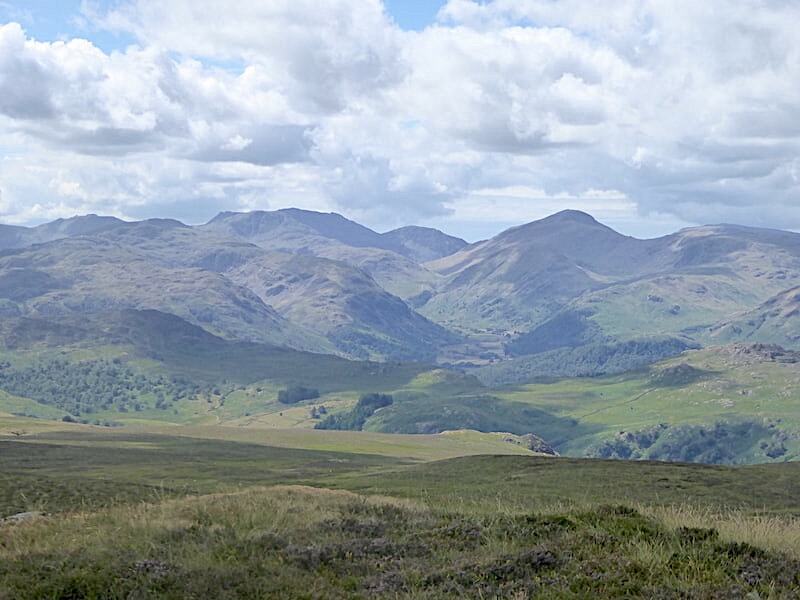 Looking north east with Bleaberry Fell at the end of the ridge and Blencathra and Clough Head beyond. 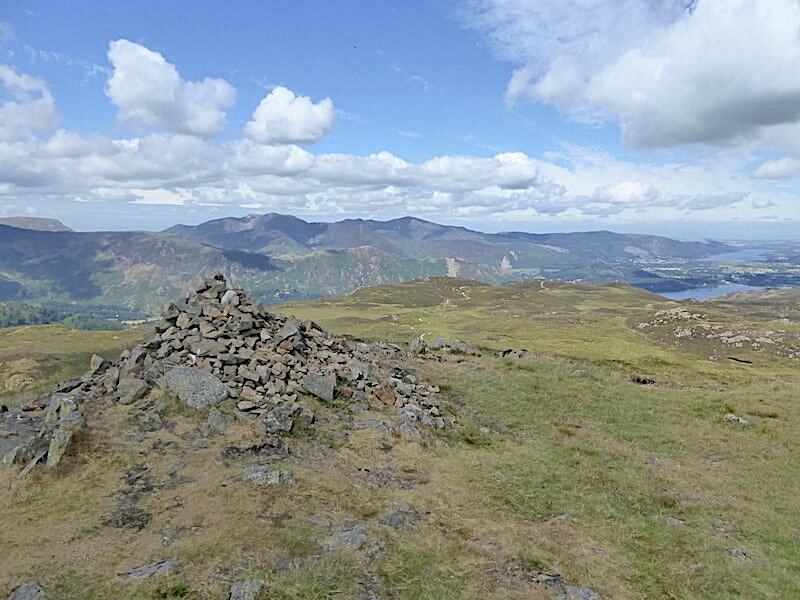 Clough Head and Calfhow Pike bathed in sunshine. 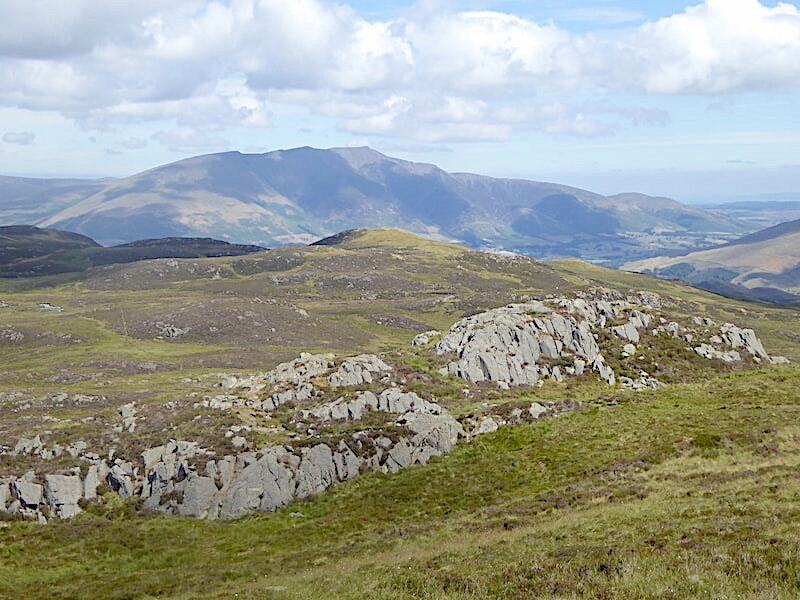 Beyond the outcrop, looking to the east are Great Dodd, Watson’s Dodd and Stybarrow Dodd. 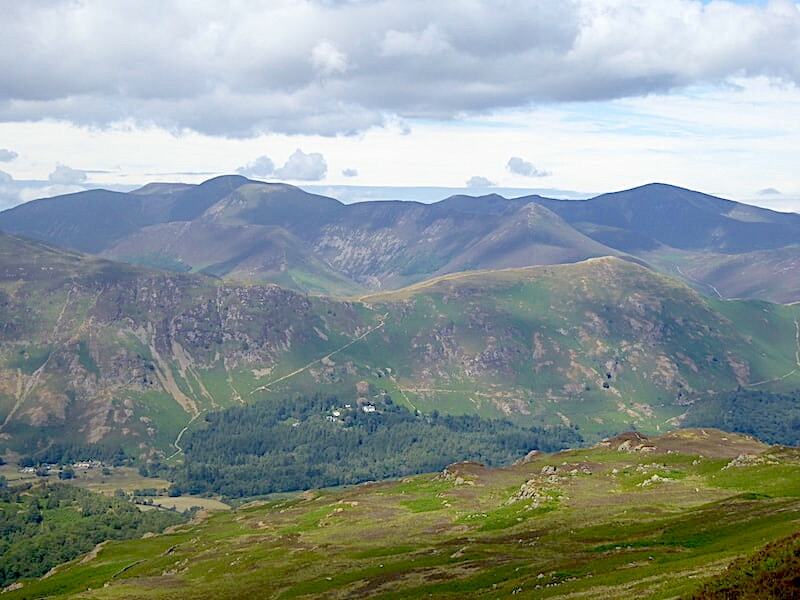 Not easy to make out under the cloud shadow but next comes Raise, Whiteside, Catstycam, Lower Man and Helvellyn. 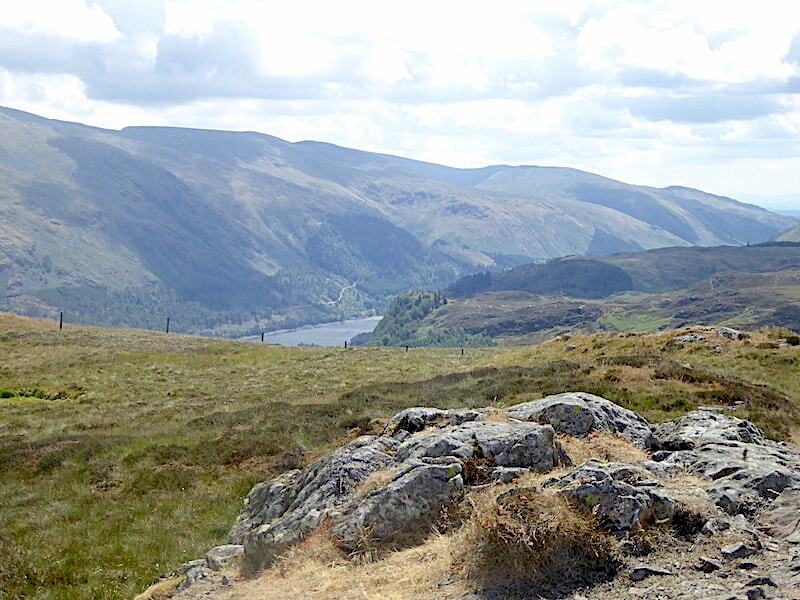 A glimpse of Thirlmere below the Helvellyn range, and then some views from the trig column …..
….. looking north east …..
….. the view to the north west …..
….. and the view to the south west …..
….. with J admiring all of it now that the football conversation has ended and the other walker has gone on his way. 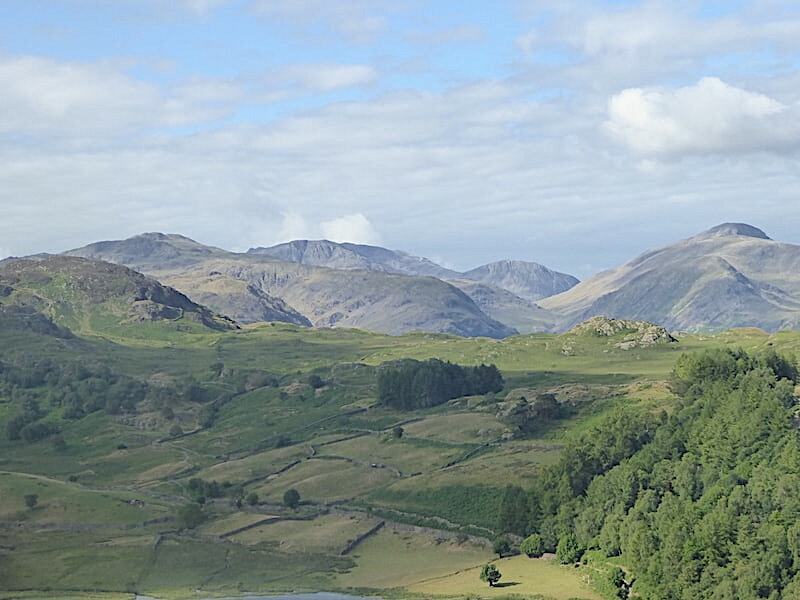 The cloud breaks up a little, the sun lights up the fells and the fabulous views are back once again. 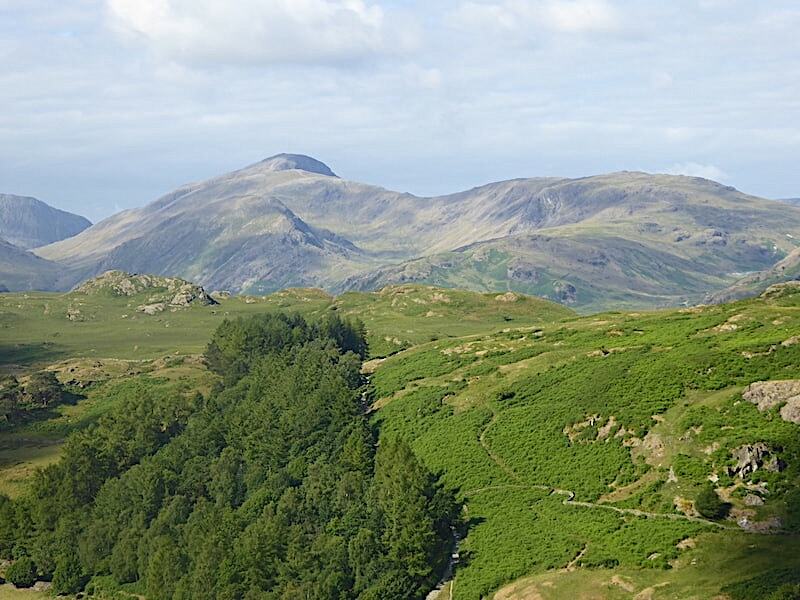 Eagle Crag taking centre stage with High Raise to its left and Crinkle Crags and Bowfell to its right. 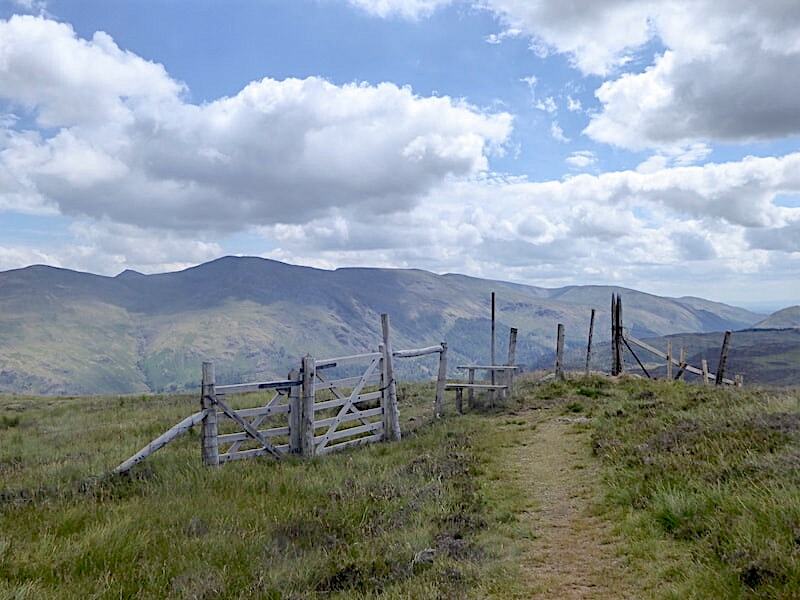 We drop down off the summit, make our way over to the fence and once over the stile we set off for the walk over to High Tove with the Helvellyn range for company. On the way down we met three separate groups of youngsters, one after the other. All were girls and all looked hot and very weary, which was hardly surprising given the size of the packs they were carrying on their backs. The very last one of the third group had just passed by us at this point, she was a long way behind the rest of her group who had already disappeared over this rise and were making the final climb up to High Seat summit. She was very red in the face, had lots of strapping on both knees and was walking very, very slowly. I did wonder if any of her group had noticed that she was a long way behind and obviously struggling. If they were all taking part in the D of E award scheme or something similar, they should all have been told not to let anyone in the group get too far behind just in case they needed help. I kept looking back until she made it over the top of this rise to make sure she was OK. She had a rest at the top and then disappeared from my view, I just hope she made it to High Seat without too much trouble. 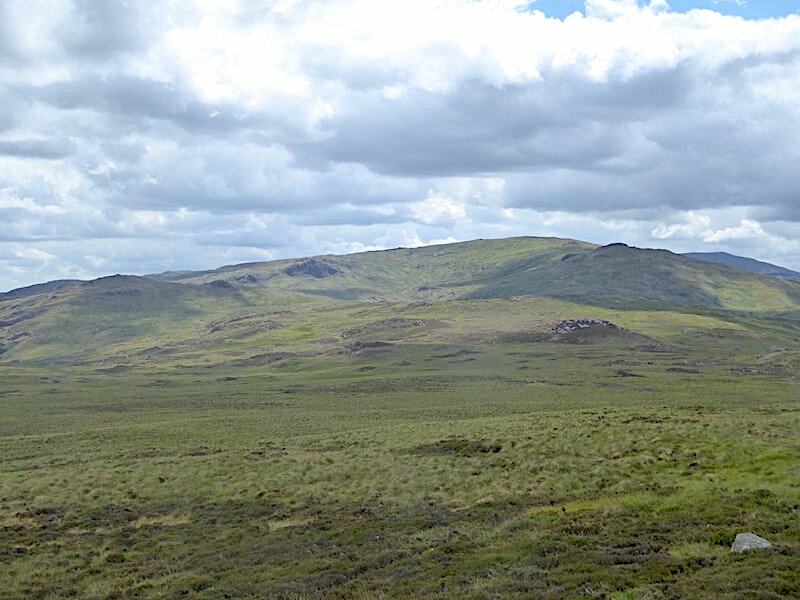 I turned my attention to the peat hags ahead of us, the area on our route map labelled The Pewits, and hoped that the weeks of dry weather had done their bit. The cloud drifted away for a few moments so I took the opportunity to take this shot of the steep Browncove Crags route up to Lower Man and Helvellyn. 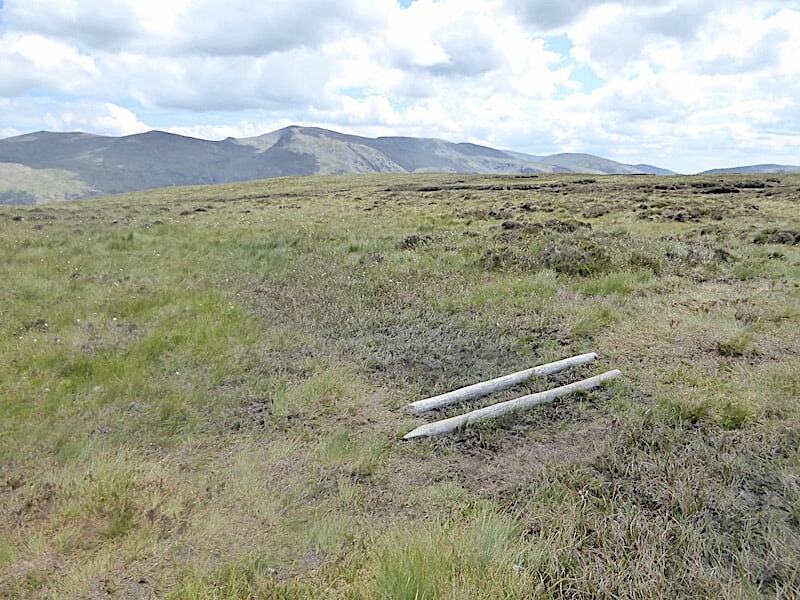 As we approached the peat hags we came across this pair of fence poles, and others close by, which are helpful as a means of crossing a particularly boggy section under normal circumstances. 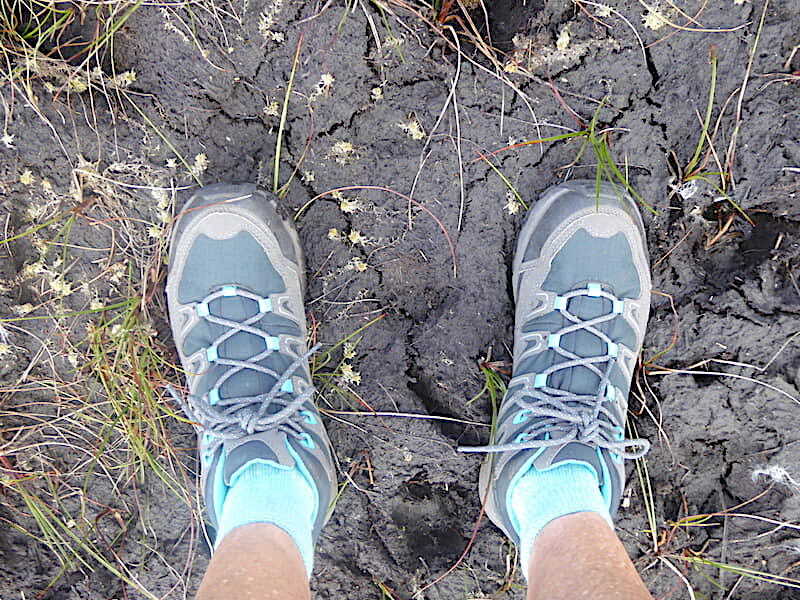 They weren’t needed today, everything underfoot was extremely dry and it was most unusual to hear the thud of our boots and the crunch of the dry vegetation instead of an ominous squelch and slurp. 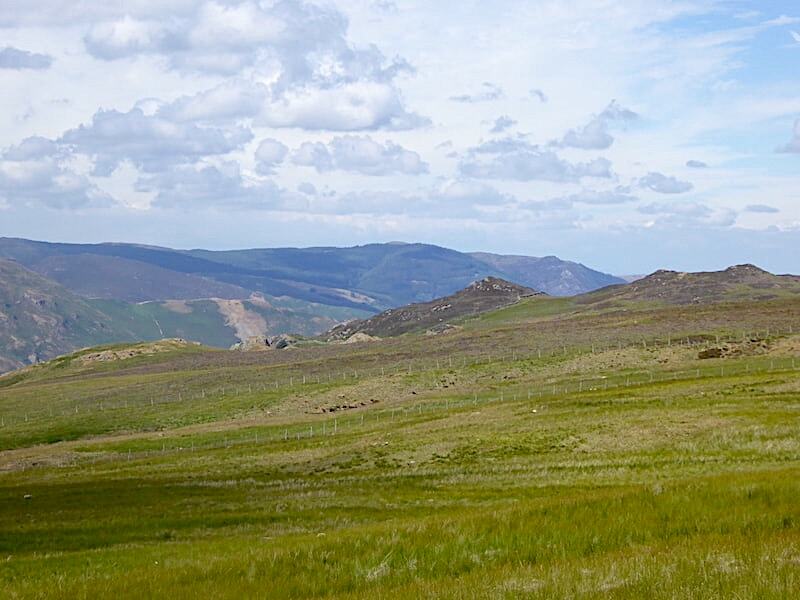 A look back in the direction of High Seat from the dried out peat hags. Dry boots and dry cracked mud beneath them. At any other time I would have been up to my knees in gloop by now. Well, no I wouldn’t because I wouldn’t have been daft enough to stand here to begin with, but you’ll know what I mean. 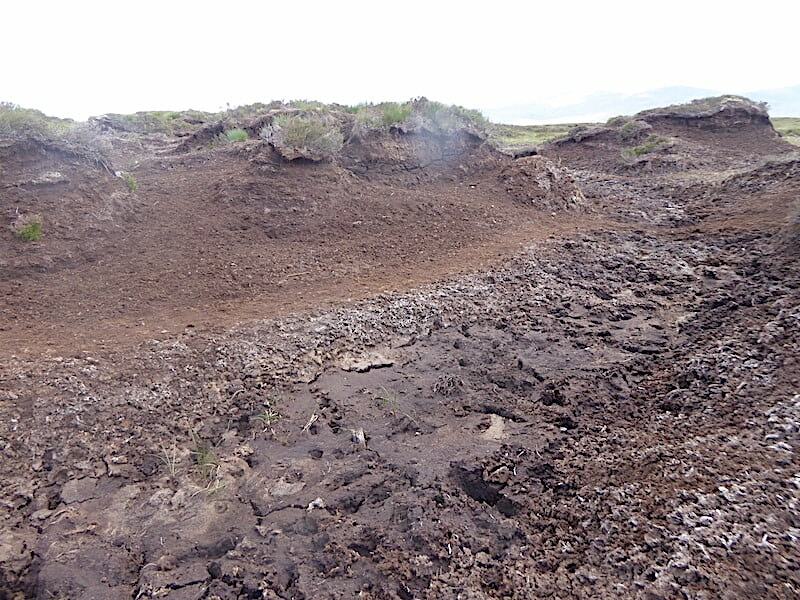 Baked dry peat hags, what a rare sight. I was the kid in a sweetshop all over again and took more photos than was strictly necessary since all of it looked just the same. No doubt you’ll be pleased that I haven’t included any more than this one. 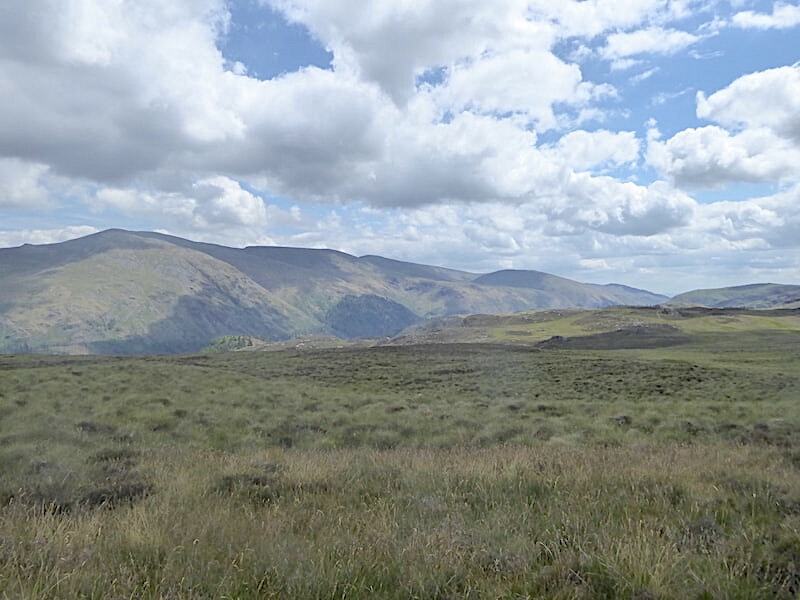 The peat hag fun and games over and done with so we carry on across the grassy ridge where apart from the Helvellyn range and Armboth Fell there isn’t a whole lot else to look at. At the fence corner we turn rightish and head over to High Tove. 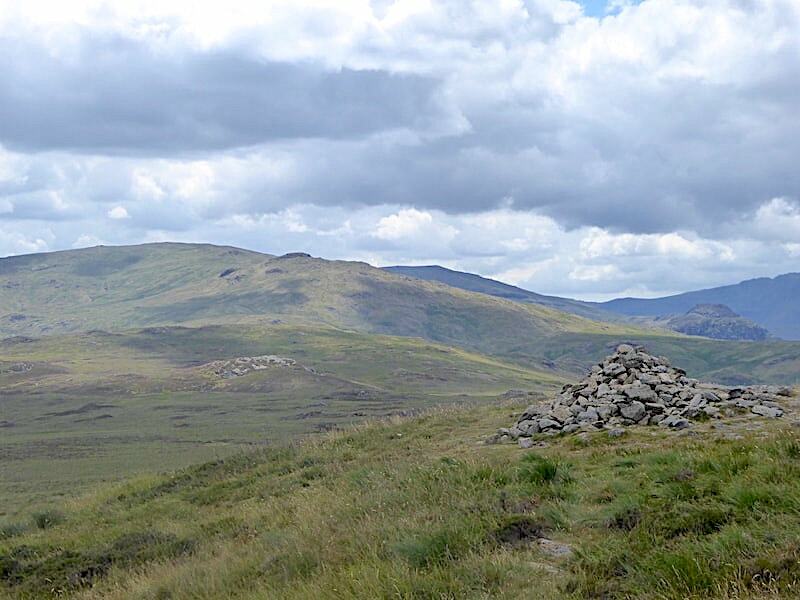 The summit cairn on High Tove with Armboth Fell below it to the left. 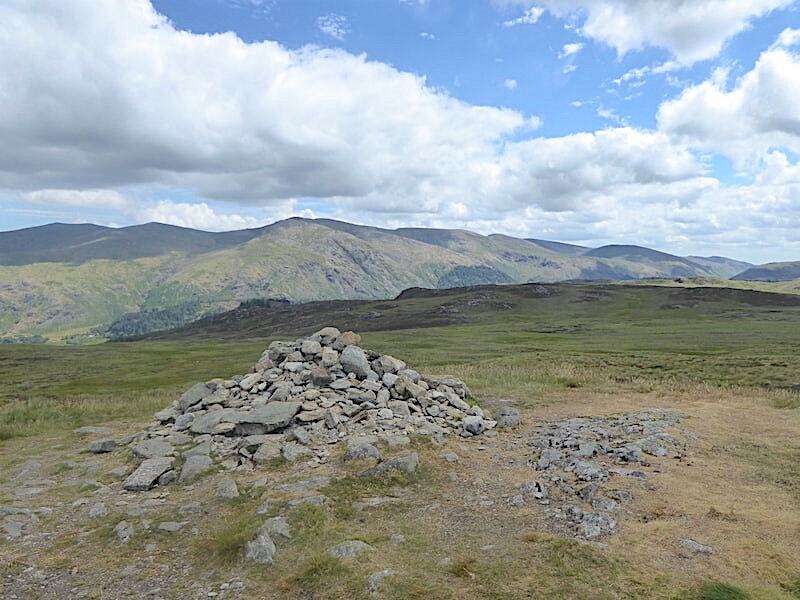 Looking across Armboth Fell to the Helvellyn group from the cairn. 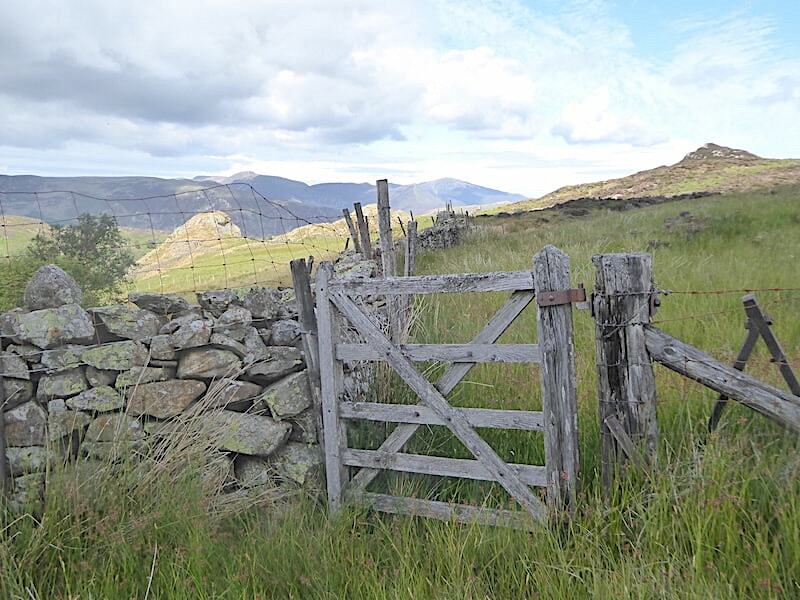 We only stopped briefly on High Tove and then we walked beyond where the photographer had been standing …..
….. went through the gate and took the path back down to Watendlath. Ullscarf isn’t the most exciting or interesting fell but it looked attractive enough in the sunlight. 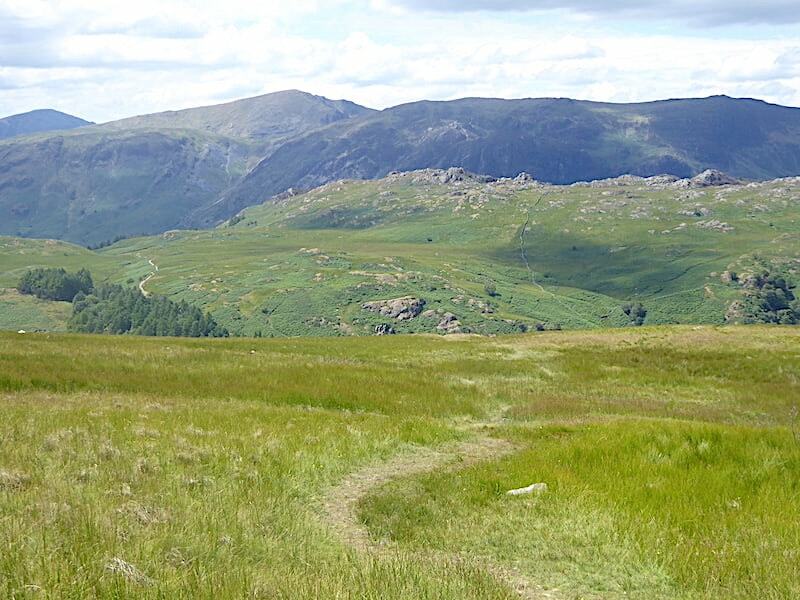 The return path to Watendlath was dry and lovely to walk over but we only sauntered down there being no good reason for haste, after all the match doesn’t start until 7.00 pm. 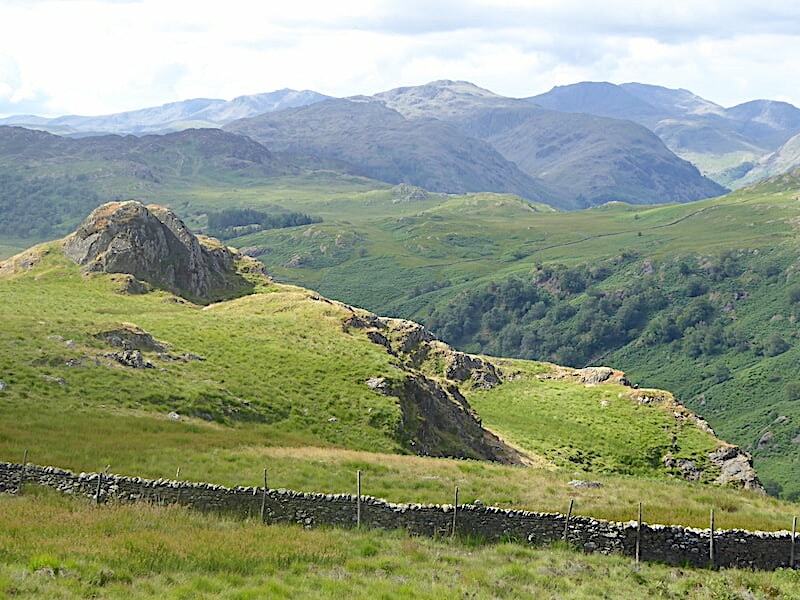 Ahead of us we can see the path from Watendlath which rises over to Puddingstone Bank, the rocky outcrops of Grange Fell to the right of it. 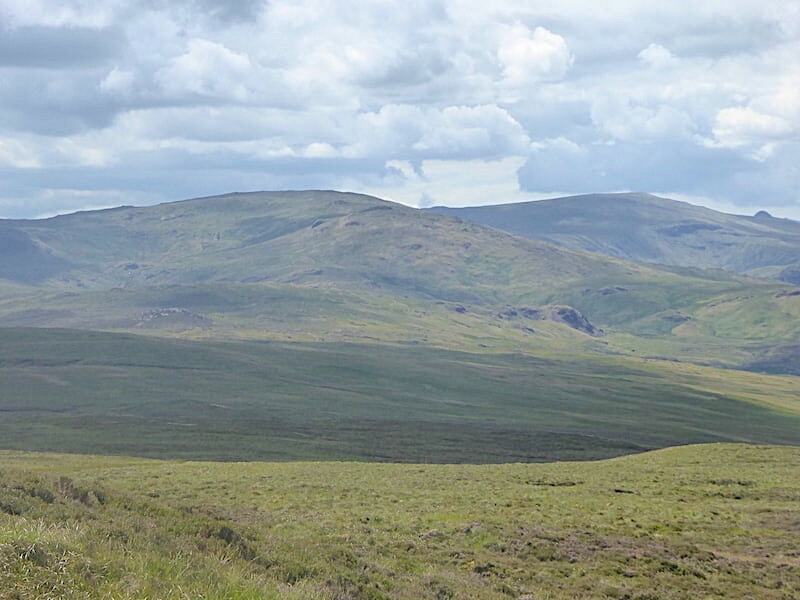 Beyond Grange Fell is the High Spy/Maiden Moor ridge with Dale Head beyond that. 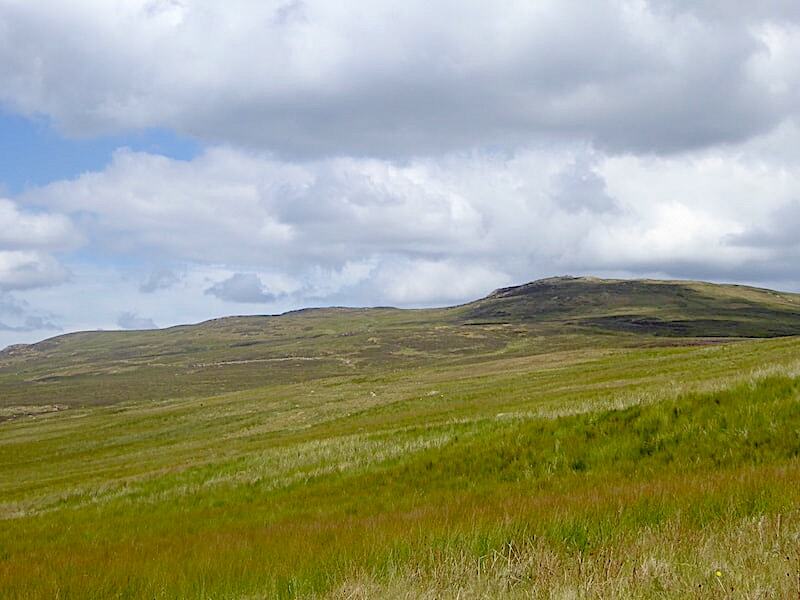 The full stretch of the High Spy/Maiden Moor ridge occupying most of the skline. 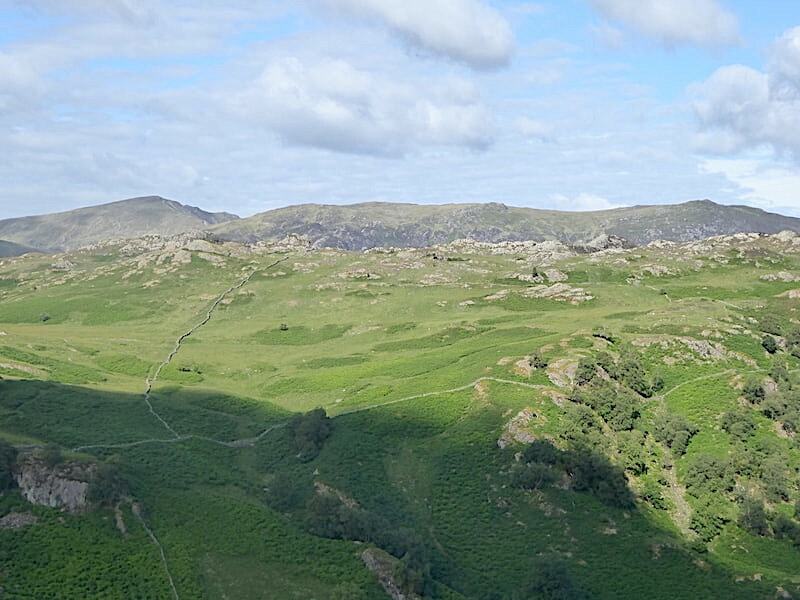 As we descend we begin to see High Seat once again …..
….. and another glimpse of Reecastle Crag. 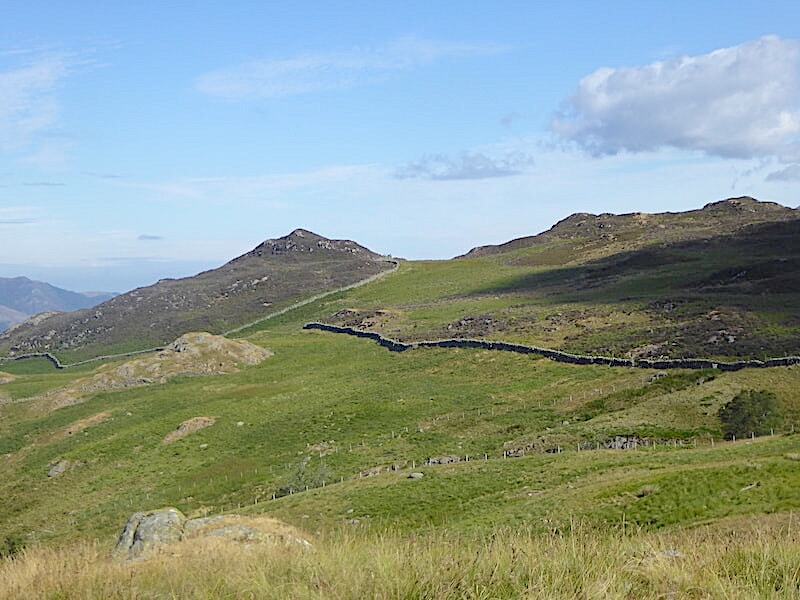 Still tramping the dry grassy route …..
….. which comes to an end at this wall and joins up with the path coming over from Wythburn. 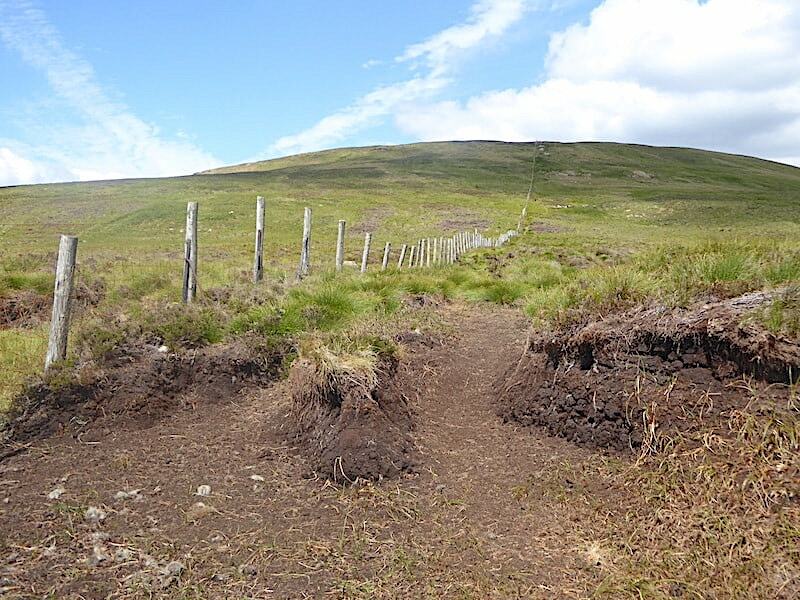 This now becomes the well known pitched path back into Watendlath. I’m not keen on the way the stones have been pitched so I have always walked down through the grass on previous occasions. The views more than make up for the minor irritation though. 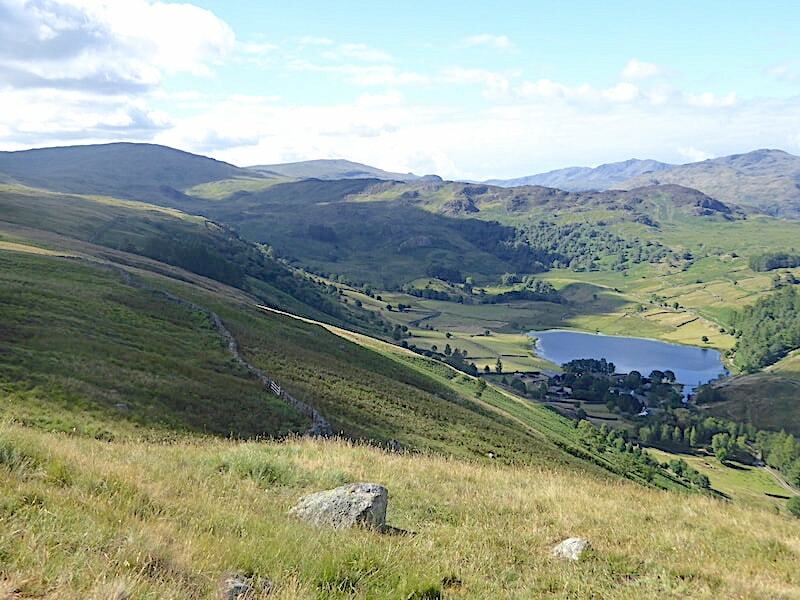 We met another group of heavily laden walkers, strapping young lads this time, a cheery bunch all of whom thanked us as we stopped to let them go by. 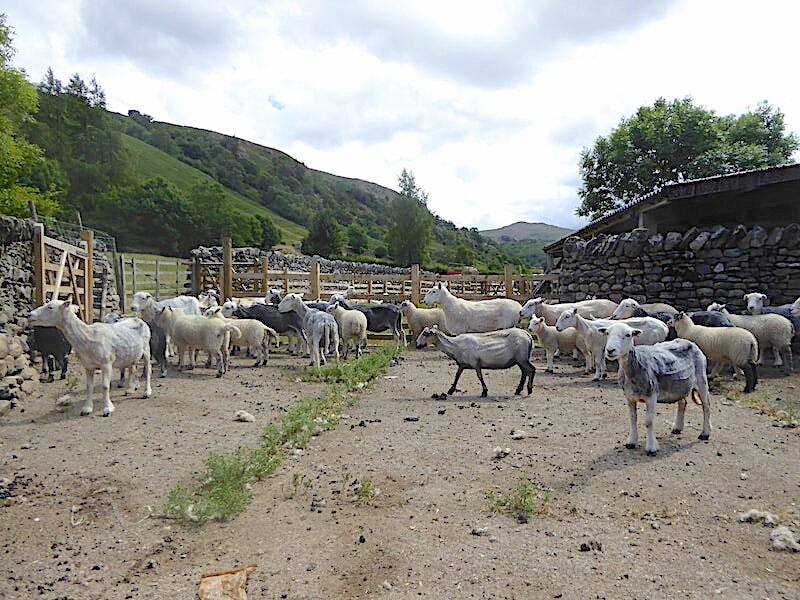 One of them mentioned they were heading for Thirlmere so I hoped they would read the notice about the road and footpaths closures which was fastened to the gate a little way behind us. 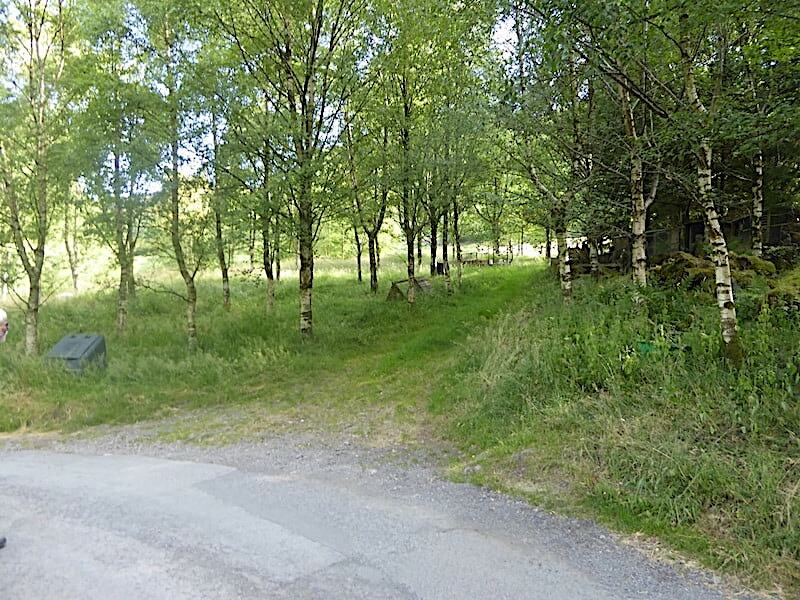 United Utilities are clearing all the trees which fell during the bad weather in early March this year and the full length of the western road from Steel End to The Benn is closed together with most of the footpaths. More details are available on the United Utilities website. Almost back down now where the sheep were making quite a racket in this holding area having just been sheared. 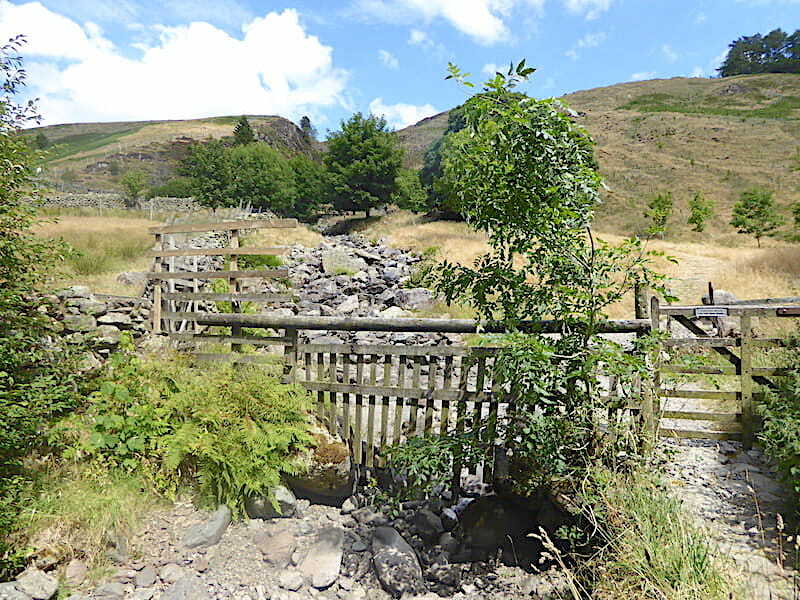 Not a trickle of water running down Raise Gill today. Up on the left is the route we followed over the hill on the left side of the ravine. 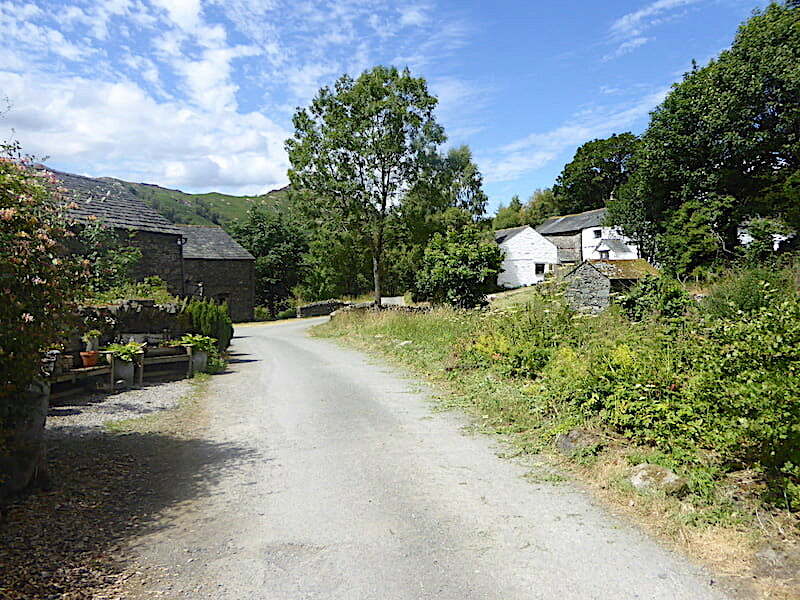 Back down in Watendlath once again and a look down the lane from the car park. Just beyond the white house on the right is the start of the path shown in the first photo. So shall we go to the tea garden or shall we just go home? Straight to the tea garden we went but were narrowly beaten to the counter by a small group who of course bought large amounts of everything so we had a bit of a wait before we were served. Coffee and cake were taken out into the garden and almost before we had finished stirring in the sugar we were surrounded by chaffinches, all perching on the edges of the table and waiting for the handouts. J shared his ginger cake with them which they took eagerly from his hand, he was their new best friend while it lasted after which he was abandoned and they went a-begging elsewhere. A lovely little interlude to round off a short, but very enjoyable walk. I’m not mentioning the result of the football match. Least said, soonest mended.